Michael Goodliffe was an actor who died in 1976. Some of his most interesting achievements were in Germany where he was held as a prisoner of war from 1940 to 1945. Goodliffe was the archetype of the traditional English actor: educated at St Edmund's public school and Keble College, Oxford University, tall and handsome with a dramatic temperament on and off-stage. His career started in the 1930s with a period in repertory in Liverpool. This was followed by a period with the Royal Shakespeare Company in Stratford. He enlisted in the army on the declaration of war. This was no doubt done out of a sense of public duty, although he had no military inclinations. He found the written questions during his examination incomprehensible, so he made good use of his artistic skills. He covered his script with drawings of soldiers and tanks. This did not prevent him from being commissioned into the Royal Warwickshire Regiment as a second lieutenant. 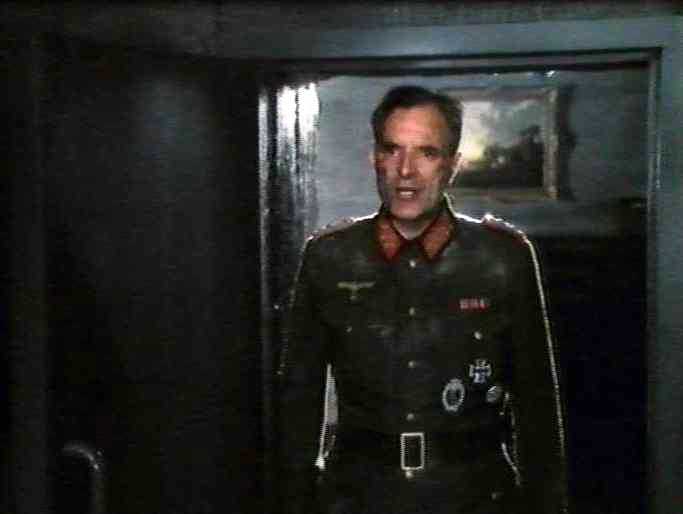 "In 1940 I found myself the only actor prisoner of war in my camp in Germany. "Put on some shows as soon as you can", I was told by the senior British Officer, General Victor Fortune. We had space for a theatre and unlimited time for rehearsal, but no stage, no lighting, no plays, no musical instruments, no make-up or costumes, very little money, and apart from my fellow pioneers, not many aspirants to stage fame. We had all been shaved completely bald by our captors "as a precaution against lice", and as a final handicap, our diet (mint tea and elderly potatoes) did not leave us with much energy to spare. But by 1945, having moved camp many times, and strengthened by reinforcements from various European débâcles, we were running an organised theatre with a permanent stage staff of carpenters and electricians, a nucleus of about two dozen very competent actors - professional and amateur - and three or four scenic designers. Our productions ranged from Coward and Rattigan to Shaw and Shakespeare." "As I write this I am in the throes of Christmas entertainments - I work all day without stopping, except for meals. I get no time to think nowadays. It is very cold and snowy here. The breath freezes on your hair and eyebrows, eyelashes and moustache and makes you look as if you have gone white with age. I could not paint the scenery this morning because the paint froze as I put it on." A shortened version of Shakespeare's Hamlet was produced at Tittmoning. Goodliffe played the title role. Costumes and make-up were provided by the Munich Opera House. Photographs of this production were taken by a local resident, Dr. Jung. 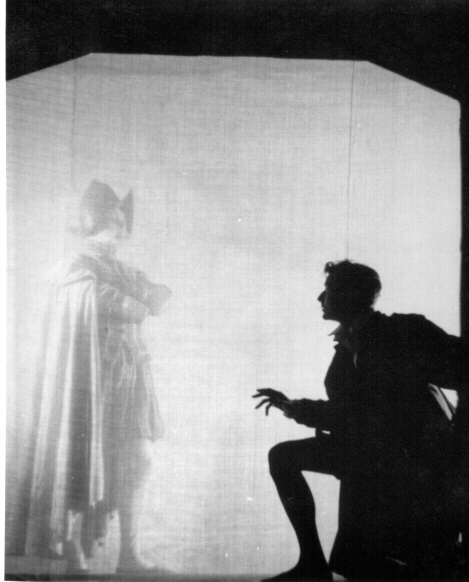 Those shown here are of Goodliffe as Hamlet with the ghost, played by Brian Shaw (who became well known for his lectures on explosives), Goodliffe with Polonius, played by Victor Hellaby, and the final scene with George Kerr, John Mullins, Michael Burrough, Jock Hamilton-Baillie, Andrew Biggar and Douglas Fisher. Jock Hamilton-Baillie featured in a number of subsequent escape attempts. He continued to take on female roles in plays after he was moved to Colditz, the POW camp for persistent escapers. See his obituary in the Daily Telegraph. Goodliffe put on other productions at Tittmoning. One of these was "Wolfenden: a tale of the frozen North" which he wrote and in which Brian Shaw, Andrew Biggar, Hugh Davies and Michael Burrough appeared. Goodliffe spent some of his time at Tittmoning painting and drawing. 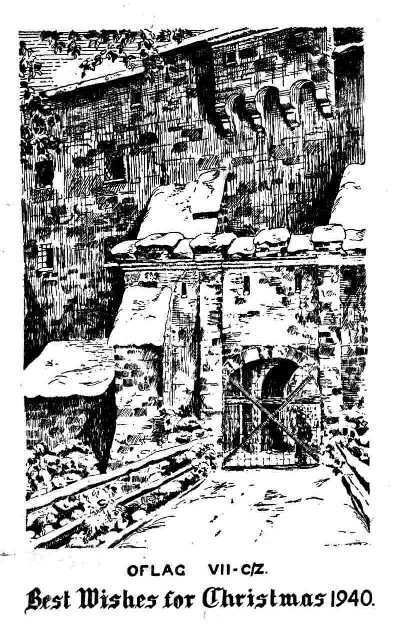 He and his fellow officers were held in a picturesque castle at Tittmoning in South Eastern Bavaria. This had been adapted for use as a prisoner of war camp for British army officers. His most memorable works from this period include a pen and ink of the castle and village with a cloud formation in the shape of the British Isles. The castle is given a fairy tale quality. The height of the hill on which it is situated is considerably exaggerated (as can be seen by comparing it with a modern photograph - click here). Click here for another Christmas card featuring the castle. 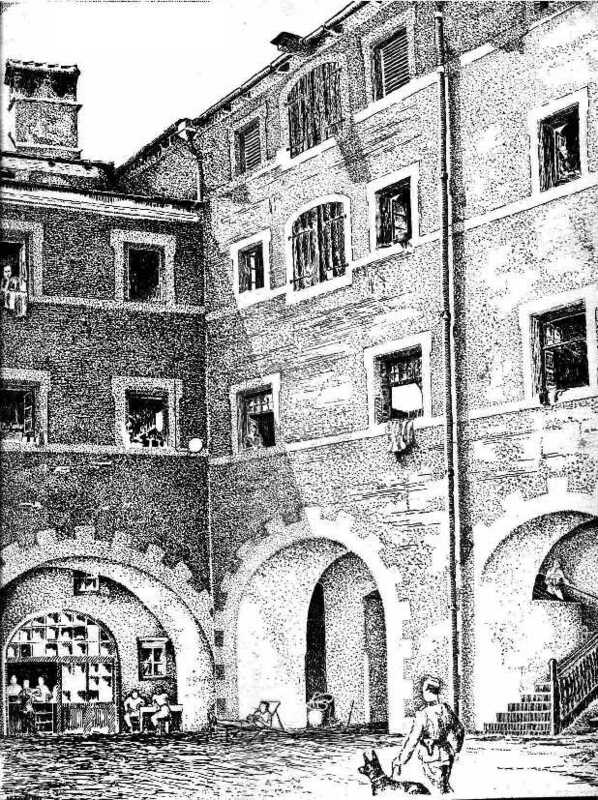 And here for a drawing of the interior courtyard. 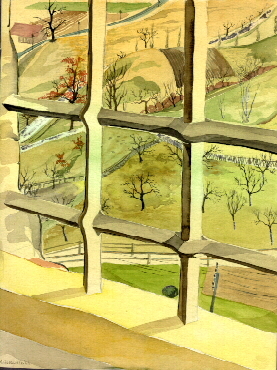 One of his water colours shows a view from the castle casement windows onto an adjoining orchard. It gives a vivid sense of how it must have felt to be confined in this mediaeval castle. 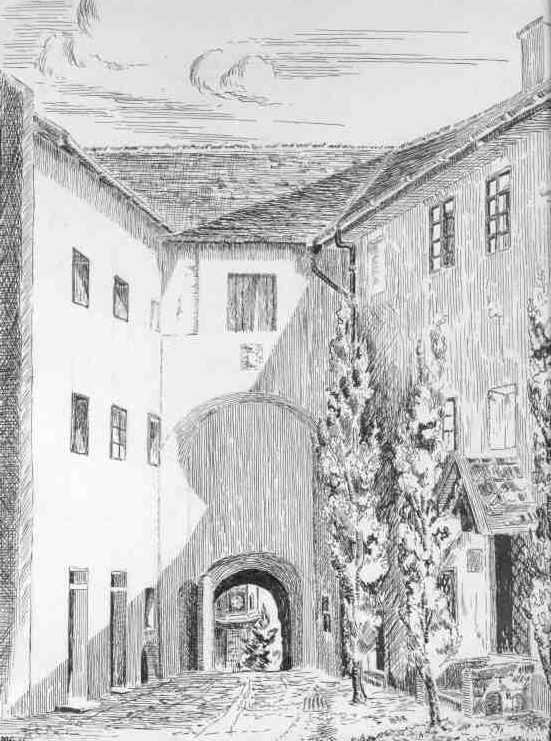 After Tittmoning Goodliffe was held briefly at Laufen, also in Bavaria (click here for a drawing of the prison, formerly the Prince-Archbishop's palace and now an office block). He was then briefly held in Warburg in Northern Germany. In 1942 Goodliffe and others were transferred to Oflag VIIC at Eichstätt, north of Munich. 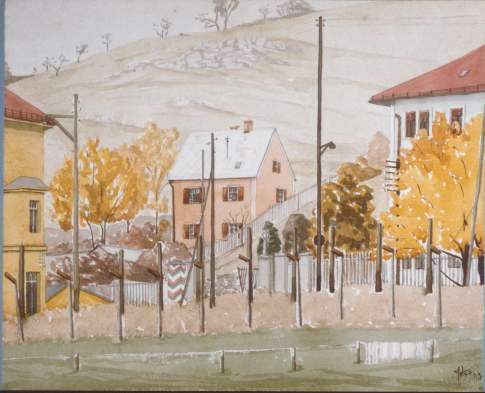 This camp is depicted in two watercolours by Michael Yates. One shows a guard post and the other the perimeter fence. 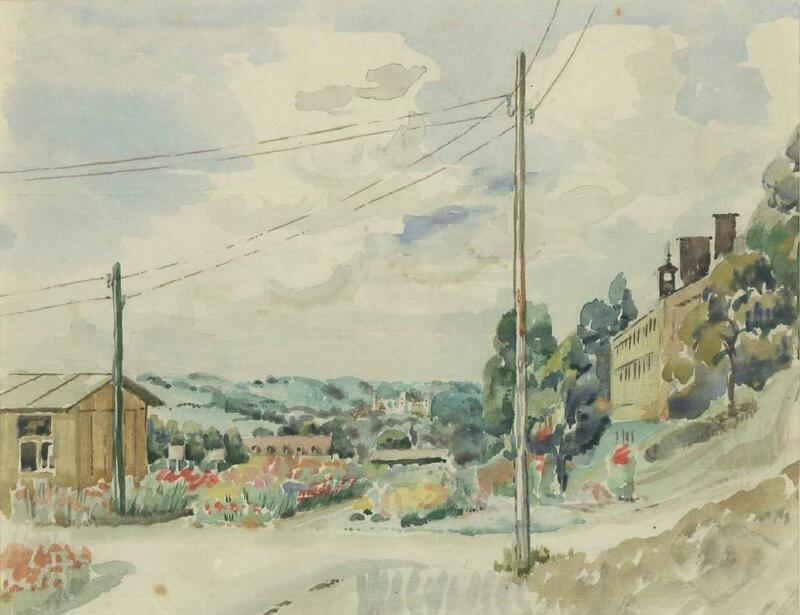 There is also a rather idealised watercolour by HC Spencer of the main road through the camp. 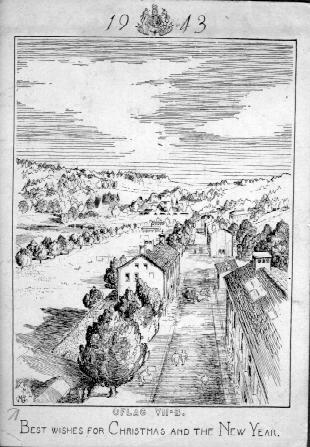 Eichstätt was a much bigger camp than Tittmoning with better facilities for theatrical productions. 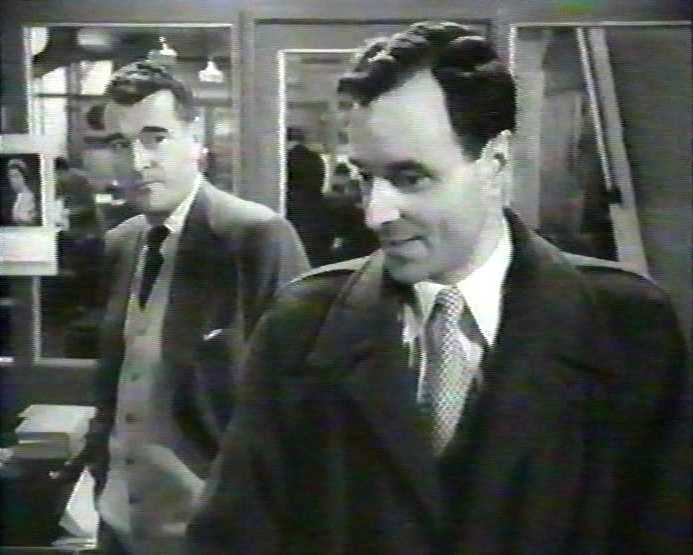 Goodliffe's fellow inmates included at least 4 other professional actors, Dan Cunningham, Wallace Finlayson (subsequently known on the West End stage as Wallace Douglas), Desmond Llewelyn and Brian McIrvine. Llewelyn might have appeared more frequently in these productions, but for his involvement in escape activities leading to his being moved to another camp, Biberach. 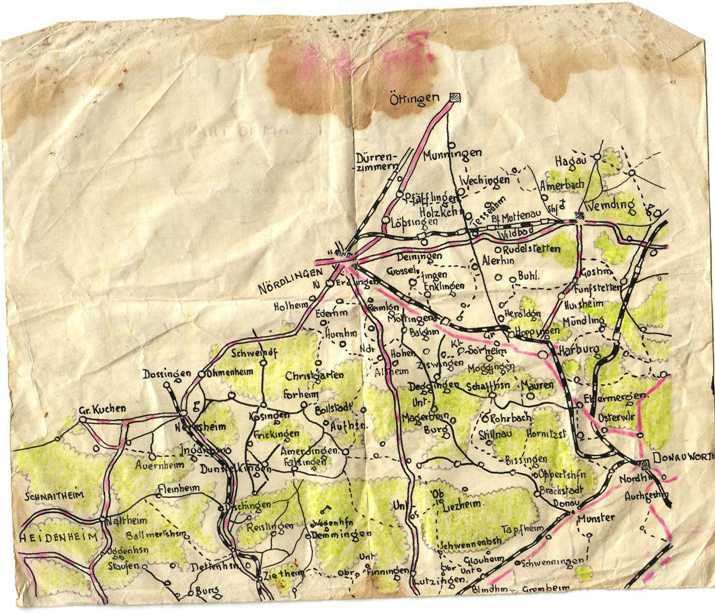 There was considerable escape activity at the camp, which included the preparation of maps of the adjoining countryside (this one by Kenneth MacQueen). The best known of these escape attempts was led by the late Major-General William Broomhall who impersonated a Wehrmacht general. The "general" and 4 others posing as an adjutant, a batman and two Swiss Red Cross officials managed to get out of the camp, but were re-captured about half an hour later. The operation was skilfully stage-managed with German uniforms specially made within the camp. 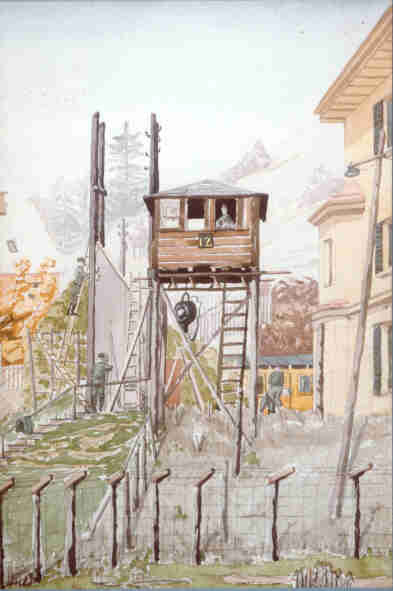 This and a number of other escape attempts from Eichstätt are described in "South to Freedom" by Prittie and Edwards. Similar skills were used for the theatrical productions at Eichstätt. "It was a matter of continual nagging, coaxing and organising. 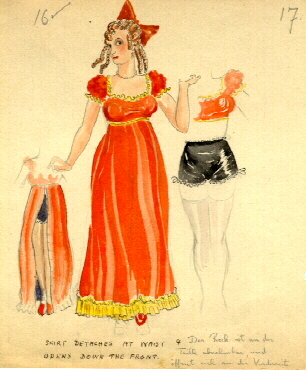 Timber, electrical fittings, dress materials, paint and costumes, all had to be got into the camp by fair means or foul [a design for one of the costumes, used in a production of "The Comedy of Errors", is shown opposite. Click here for the remaining costume designs]. We were bribing fairly soon and after the first year we became highly organised so that we managed to get most of our requirements sent into the camp by the Germans. But certain makeshift devices still persisted. For example we found that excellent three-ply scenery flats could be constructed from Red Cross parcel crates. Dried milk tins, besides their normal uses as chimneys, stoves or tunnel ventilation-pipes, could also be made into reflectors and spotlights. Pyjamas of the more exotic designs were often used to make feminine creations." 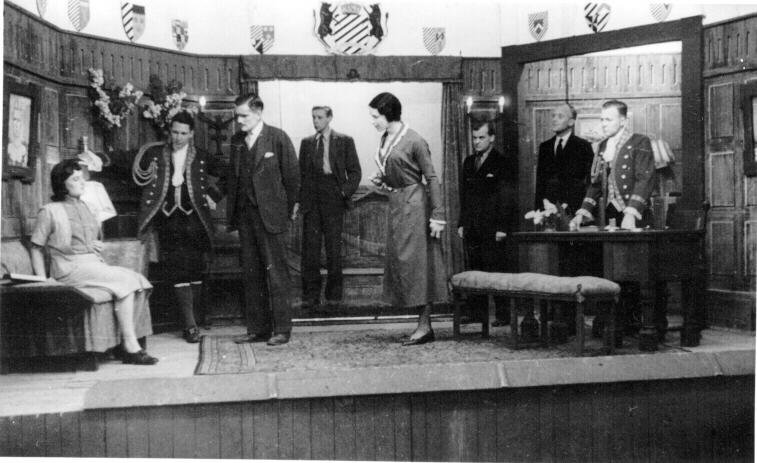 One of the first plays at Eichstätt was "Post-Mortem", written by Noel Coward in 1930. It was given its world première at Eichstätt in January 1943 (having never been staged by Coward himself) in a production by Wallace Finlayson. The theatre at Eichstätt included a reasonable sized stage. It was, however, set at a curious angle across the corner, in one of the buildings at the camp, with room for an audience of about 200. The theatre building is shown towards the middle (on the left side of the road) of a Christmas card drawn by Goodliffe in 1943. This was published after the war in the "Illustrated London News". 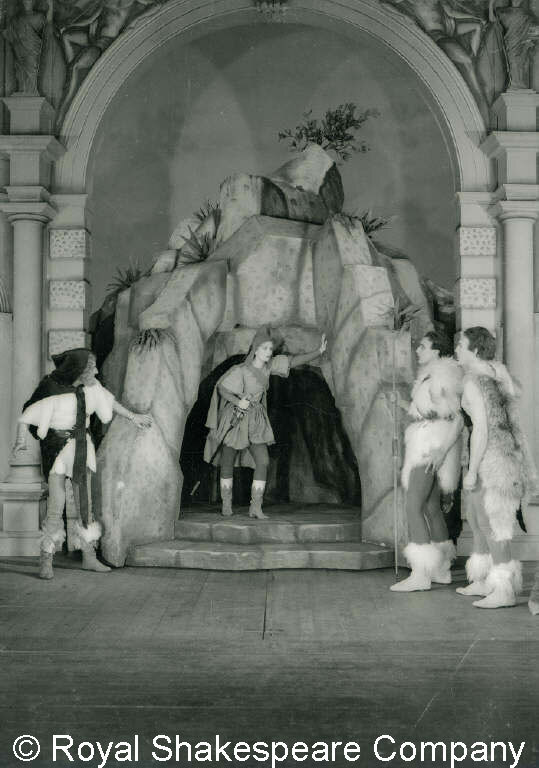 Many of the plays performed at Eichstätt boasted lavish sets and costumes, provided by Munich Opera or designed by Brian McIrvine and others. Leichner make-up was ordered from Berlin. 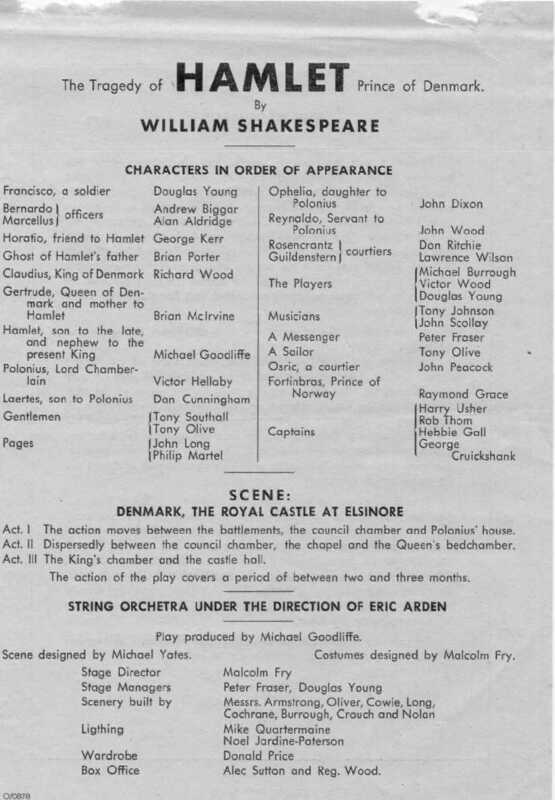 Programmes for each play were printed locally and orchestral accompaniment was often provided. Photographs were taken by the prison guards and show the professional quality of these productions. Most of the plays featured dramatic or melodramatic plots, chosen, no doubt, to relieve the boredom of life in prison. Both the prisoners and the German military authorities regarded artistic activities at the camp as a "good thing". The guards co-operated, hoping to divert energies which might otherwise be devoted to escape attempts. The guards also apparently took the view that the more serious productions benefited from cultural influence of the "master race". German army officers sat in the front row seats at every performance of the more impressive plays. 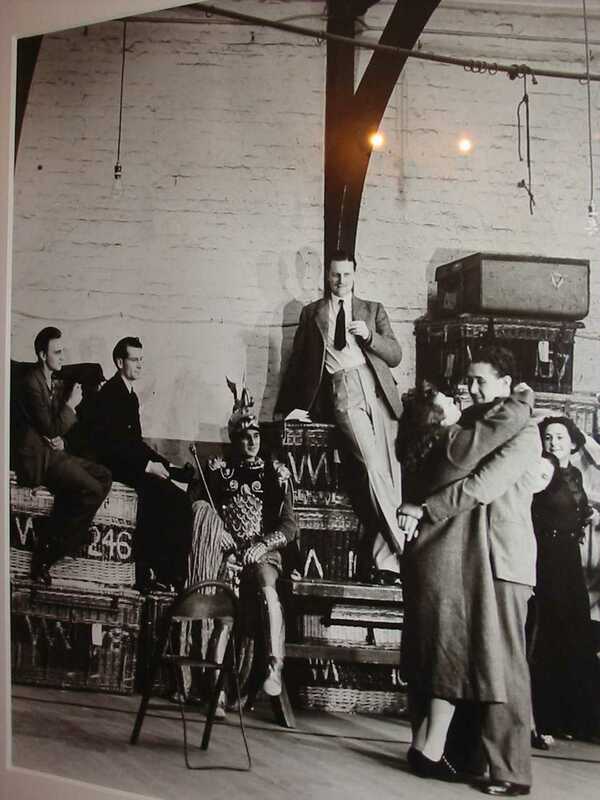 "A very interesting side of our prison theatre was the attitude of the audiences. At first they would be easy to please, but we soon found that unless the presentation of female roles was intelligently tackled, any serious productions were impossible. Two or three clever actors solved this problem, so that our audiences accepted them exactly as the Elizabethans accepted their boy-actors." John Dixon was one of the last surviving participants in these productions. He died in May 2013. See photo of him taken in February 2011 with Jonathan Goodliffe, the designer of this site. One of the most lavish productions (by Dan Cunningham) was of "Gaslight" by Patrick Hamilton, in November 1943 (click here for the programme). "Here is Brian McIrvine in one of his amazing metamorphoses - in "Gaslight" with me burbling cynicisms and sarcasms into his ear! A vast musical festival has started on a month's run - six separate programmes - a symphony concert - a light orchestral - a choral - a chamber music - dance music, and finally "Song and dance round the World", the last greatly assisted by the presence of Maoris, Russians, Spaniards, etc. etc. The items include Bach's Cantata for the New Year, selections from Mozart's "The Magic Flute", a Flute Concerto and many other headline masterpieces. Richard Wood is managing it all. He comes from Glyndebourne." The music festival referred to in this letter was held over 33 days in February and March 1944. The choral and orchestral programme included Benjamin Britten's musical setting of "The Ballad of Little Musgrave and Lady Barnard". This was specially written for and dedicated to Richard Wood and the musicians at the POW camp. A copy of the programme is accessible from this section of one of the links featured below. 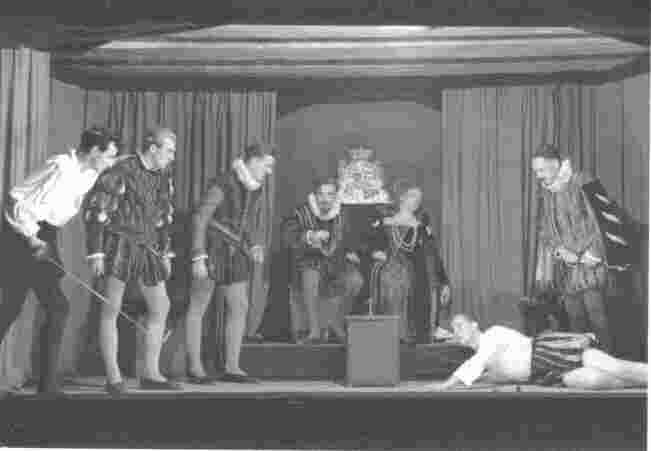 In April 1944 Goodliffe put on another production of Hamlet. This was accompanied by a string orchestra under Eric Arden, who also wrote much of the specially composed music. It was more ambitious than the one at Tittmoning, although the amateurish photographs do not do it justice. The photograph shown on the left features Richard Wood, Dan Cunningham, John Dixon and Brian McIrvine. 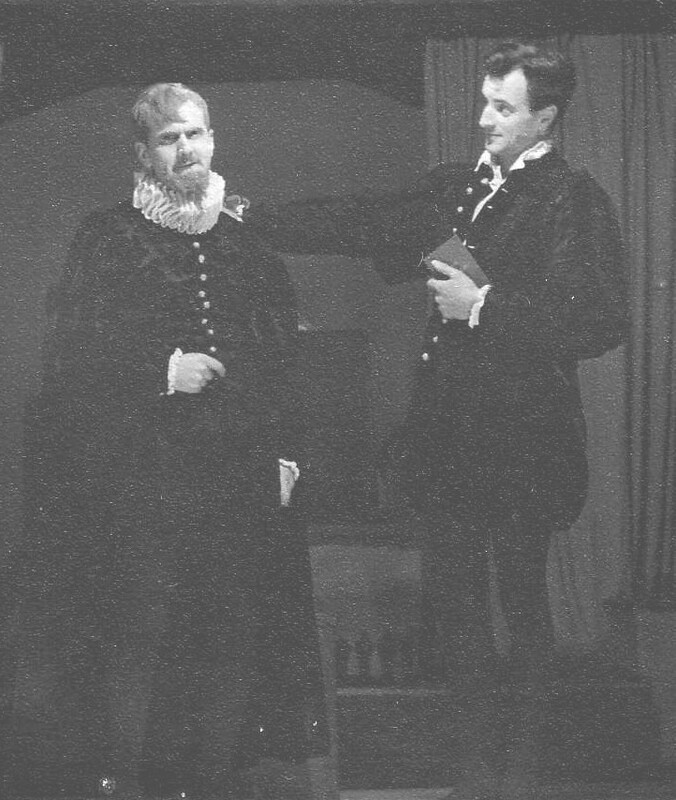 Click here for a further photograph from this production, featuring Goodliffe and Richard Wood as Claudius. "I have thrown discretion to the winds and have embarked on a three-act short version of "Hamlet", cutting it down to about 22 hours! Ophelia is our big problem. I am cutting the Nunnery Scene and using her for a second motive for Laertes' anger at the end. The whole graveyard scene is out too. But tho' you mightn't believe it the play still hangs together fairly well! Demand for the tickets was such that we had to extend the run for a further 10 days." 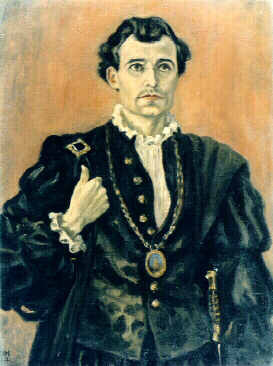 A portrait in oils of Goodliffe as Hamlet (shown at the beginning of this Web page - photograph by Prudence Cummings Associates) was painted by the late Aubrey Davidson-Houston. 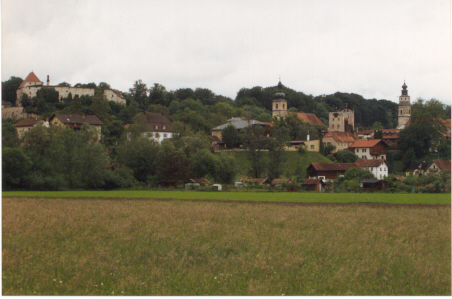 Davidson-Houston was then an army major held at Eichstätt. 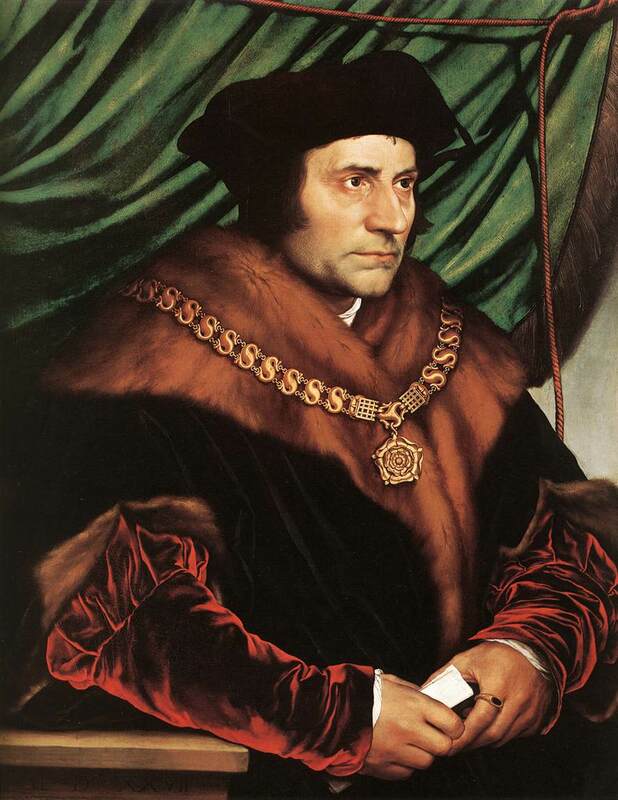 He was subsequently to become a leading portrait painter. A full programme and cast list was printed for this and other productions (click here for the Hamlet cast list - a large image it may take some time to load). 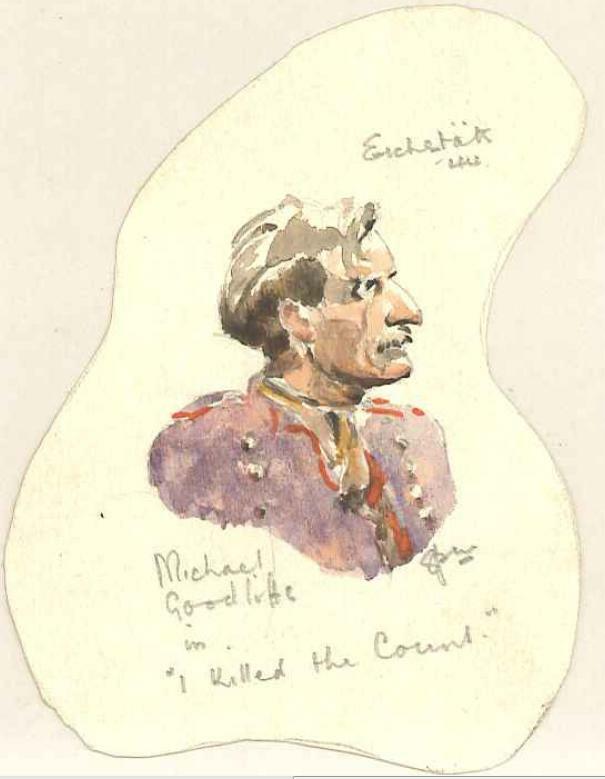 Another portrait of Goodliffe in a production at Eichstätt of "I killed the count", A play by Alec Coppel, was painted in water colours by HC Spencer. 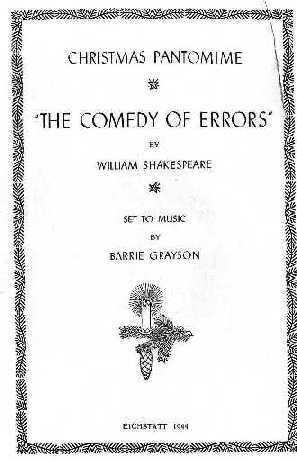 For Christmas 1944 a gala production of Shakespeare's "A Comedy of Errors" was laid on. 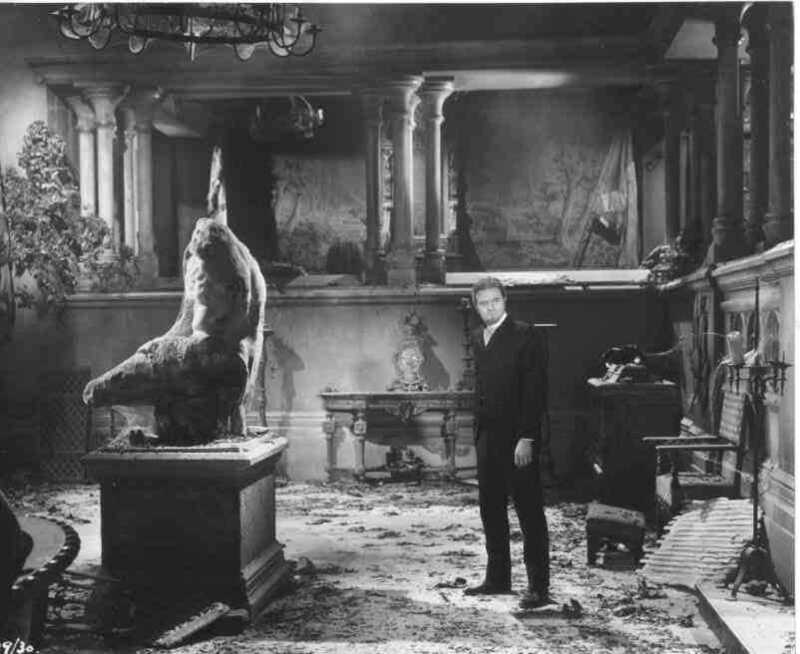 The set, designed by Michael Yates (who had also produced the sets for "Hamlet"), was in a style similar to "The Cabinet of Dr. Caligari". The orchestra (click here for a photograph of the players) was directed by Barrie Grayson. The play was interspersed with an overture, mime, ballet, operatic recitative and arias and a finale and jig. 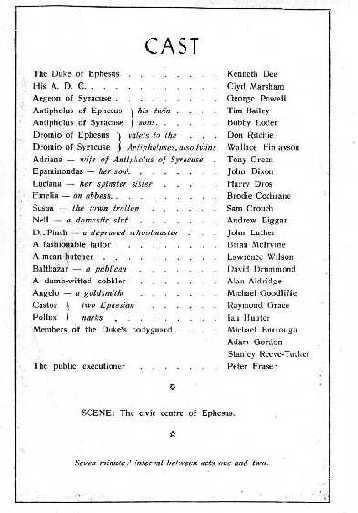 [Click here for a the cast list of "A Comedy of Errors" - and here for the front of the programme]. 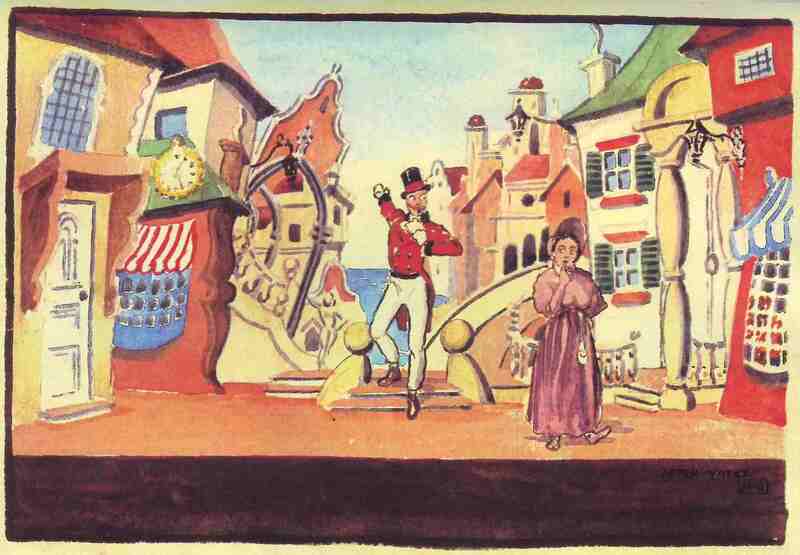 Goodliffe produced a small watercolour painting of Yates' stage design. One of the most striking stage photographs (left) from this period is of "The Case of the Frightened Lady" by Edgar Wallace. It was produced by Wallace Finlayson. The photo shows John Dixon, J D Alger, Desmond Llewelyn, Brian McIrvine, Lawrence Wilson, Wallace Finlayson, John Stansfield and Peter Ambery. Lieut. Col Alger was an American soldier captured in Tunisia in 1943. He and his fellow US officers, including Lieut. Col Waters, General George Patton's son in law, were held at Eichstätt for only a brief period. Lieut. Col Alger had led the Second Battalion, 1st Armored Regiment, 1st Amored Division, USA, into battle at Sidi Bou Zid during the second day of what is now known as the Battle of the Kasserine Pass. General Sir William Jackson in his book 'The Battle For North Africa 1940-1943' wrote of Colonel Alger's Second Battalion attack 'If ever there was a repetition of the charge of the Light Brigade at Balaclava this was it.' It was an attack across 13 miles of desert against two Panzer divisions by a single battalion. It was destroyed in its attack. The experiences of US prisoners of war at Eichstätt are described at "The Kriegies of Oflag 64". For a web site devoted to films more or less closely based on Edgar Wallace's play click here. As well as full dramatic productions at Eichstätt there were readings from other Shakespearean plays, sketches and pantomimes at Christmas. Many former POWs went on after the war to careers in stage, film and music. 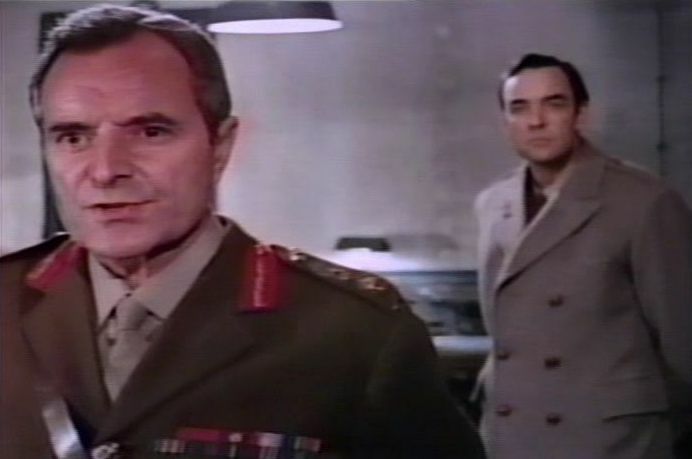 The "War play" and the "War Film"
The "war play" and "war film" developed over the 20 years after the end of World War II and played a major part in Goodliffe's subsequent acting career. 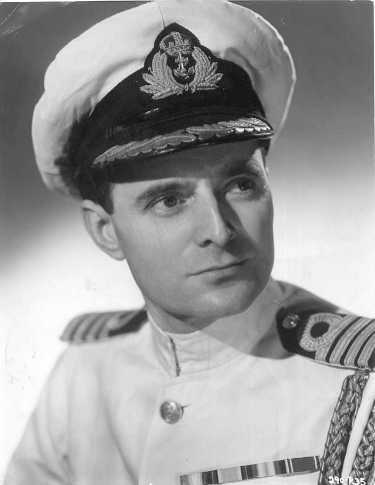 Goodliffe also appeared in a number of war films. One of the best of these, in 1950, was "The Wooden Horse", based on the book by Eric Williams. It was a historically accurate record of a successful escape attempt from Stalag Luft III, a prisoner of war camp for Air Force and Fleet Air Arm officers. 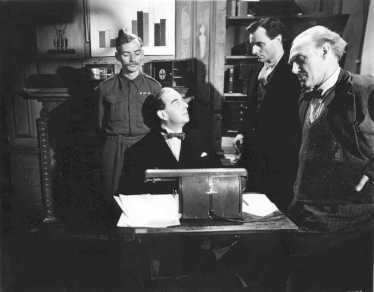 Stalag Luft III had also had its theatre, where the leading actors included Rupert Davies and John Casson. 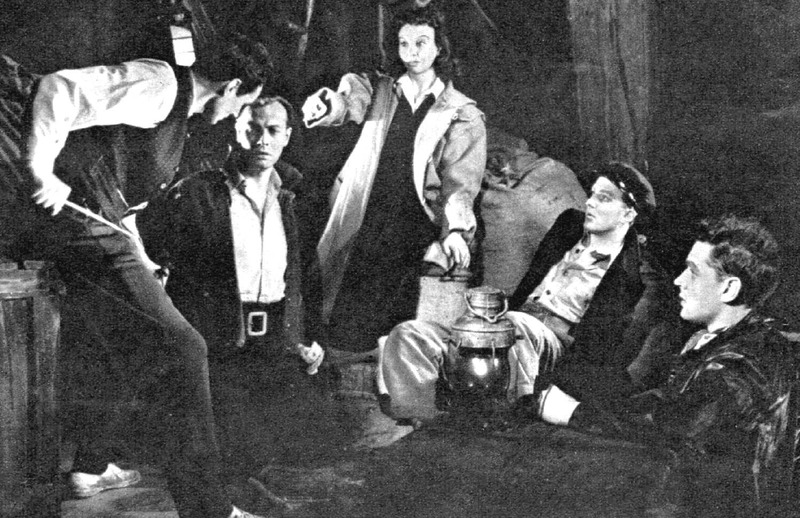 The photograph from this production shows Goodliffe playing one of the POWs with Dan Cunningham as well as Leo Genn. 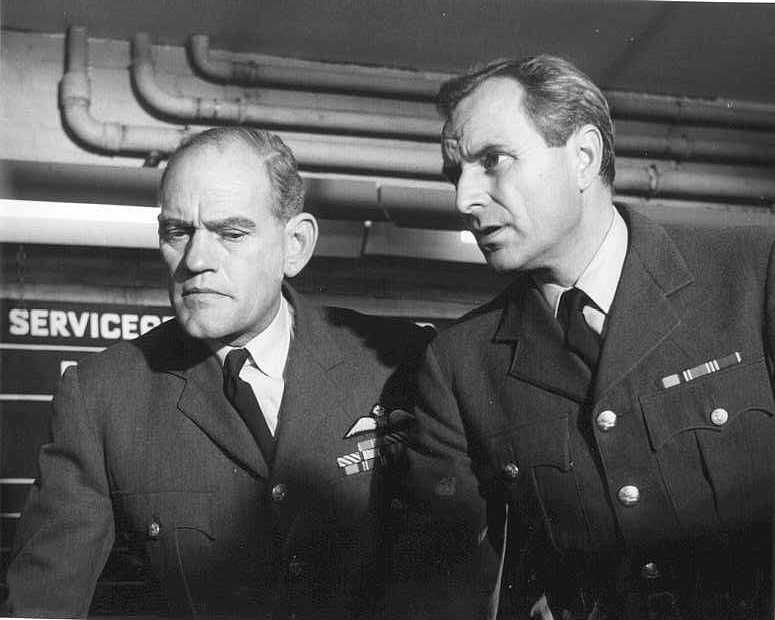 Goodliffe also played a British Air Force officer in "The One that Got Away" (1957) a film about Franz von Werra (played by Hardy Kruger), one of the few/only German prisoners of war to have escaped back to Germany. 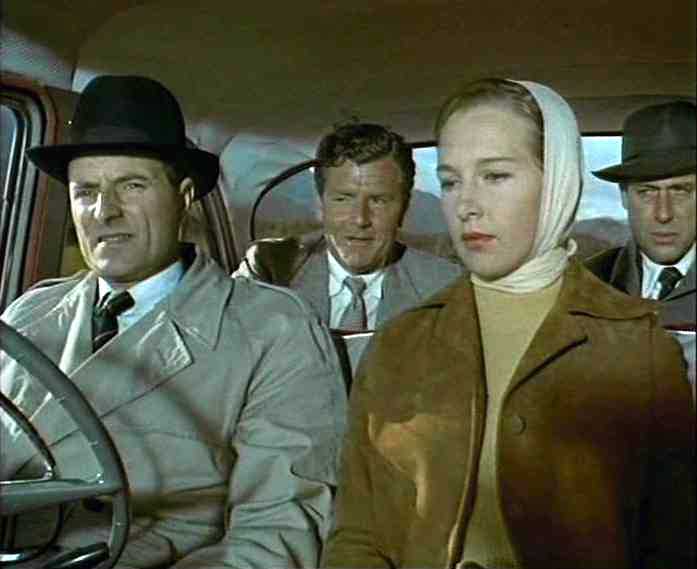 The "escape film" genre continued into the 1960s, but later examples were dominated by American actors. They abandoned any pretence of historical accuracy. A good example of this genre is "Von Ryan's Express", released in 1965 and still regularly repeated on television, starring Frank Sinatra, as an American showing the British, including Trevor Howard and Edward Mulhare, how to win the war. Goodliffe made a cameo appearance. He did not enjoy this, his only appearance in a Hollywood film. Goodliffe's appearances in POW films spanned over 20 years. The last of these was "Fifth Day of Peace" (released in Germany in 1972 as "Gott Mitt Uns"). In this film he played a Canadian general with a fierce loyalty to the honour of the military. The general encouraged his subordinate (played by Richard Johnson - shown opposite) to allow German prisoners of war to execute deserters five days after the end of World War II. This film (critically underrated in my view) was never released in the United Kingdom. 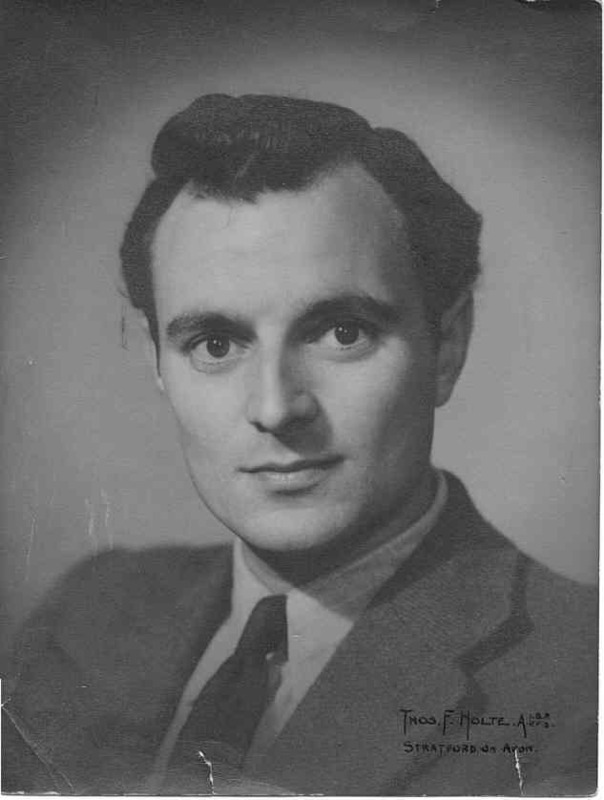 Apart from the theme of war, Goodliffe's career after his release focused mainly on theatre during the 40s and 50s, film in the early 1960s, and television thereafter. Notable appearances on stage included Somerset Maugham's "The Circle" , in which he appeared while he was still an army officer, Anthony and Cleopatra, Vanbrugh's "The Relapse", another play by Charles Morgan, "The Burning Glass" with Laurence Naismith and Faith Brook (not as good as "The River Line" on my reading of the script), Much Ado about Nothing starring John Gielgud, "The Lark" by Jean Anouilh (see portrait by Edinburgh artist Marshall Hunter), the "Sound of Murder" by William Fairchild, "The Gazebo", by Alec Coppel with Ian Carmichael and Moira Lister (which had a very long run at "The Savoy"), "Dr Faustus", by Marlowe "An Ideal Husband" by Oscar Wilde, starring Margaret Lockwood and Richard Todd, "Ivanov" and "Richard III" , with the Prospect Theatre Company, and "The Chalk Garden" by Enid Bagnold with Gladys Cooper, Joan Greenwood and Peter Bayliss. 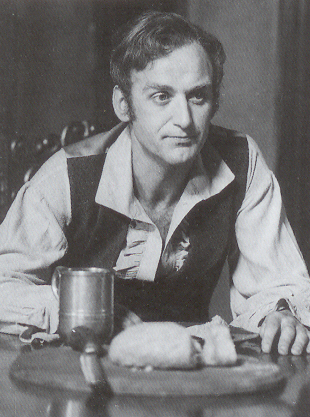 Goodliffe appeared twice in plays on Broadway in New York. 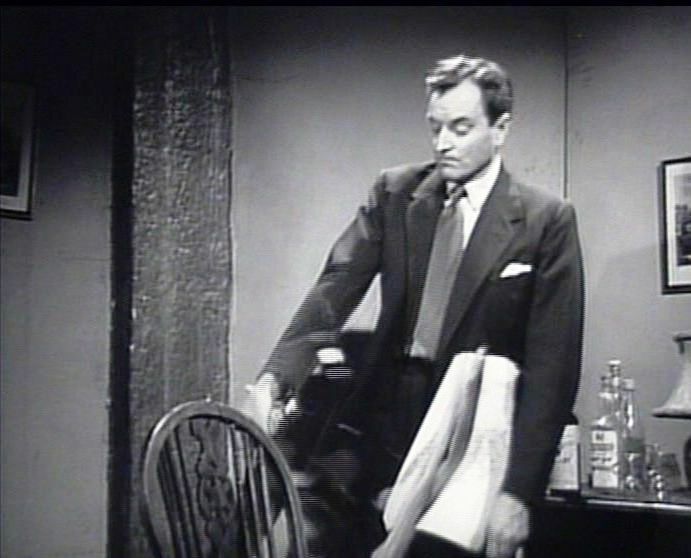 His first appearance was in "The Living Room" by Graham Greene in 1954. The second was in 1964 in Sponono by Alan Paton and Krishna Shah. Neither play was a commercial success. Another ambitious, but unsuccessful, venture in which Goodliffe appeared was the first dramatisation in 1965 of EM Forster's "Howards End". It also featured Gwen Watford, Joyce Carey, Andrew Ray and Gemma Jones. It was produced for the theatre by the 7th Earl of Harewood and directed by Frith Banbury. Forster himself helped with the production. 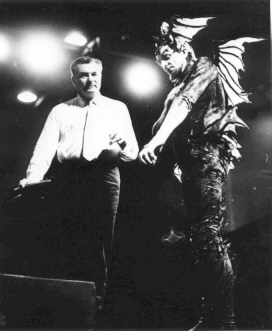 Immediately before Goodliffe's death he was due to appear in a revival of "Equus" by Peter Schaffer. He was due to play the father "Frank Strang" with Colin Blakely in the leading role. At this time, however, he was suffering from depression. He had more difficulty than usual in learning and remembering his lines. This seems to have been one of the factors leading to his breakdown, just before the play was due to open, and to his suicide in hospital a few days later. Goodliffe's 3 best performances on film were (in my opinion) in "Cry the Beloved Country", "A Night to Remember" and "Fifth day of Peace" (see above). The first of these, which starred Canada Lee and a very young Sidney Poitier, seems very old fashioned and paternalistic in its attitude to race issues (it has since been remade). Most of the black actors were not professionals, by necessity no doubt. It is nevertheless very moving. Goodliffe knew Alan Paton, the author of the book on which the film was based (and an active contributor to the production of the film). 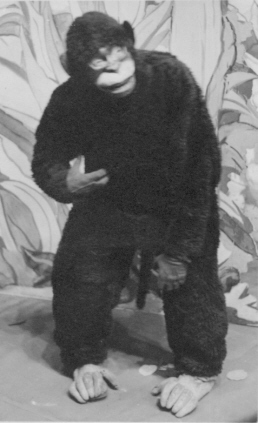 Goodliffe appeared on Broadway in the early 60s in a play, "Sponono", based on a collection of short stories "Tales from a Troubled Land" by Paton (see the list of Goodliffe's post war appearances at the end of this web page). "A Night to Remember" told the story of the sinking of "The Titanic". Goodliffe played the architect of the ship, Thomas Andrews. 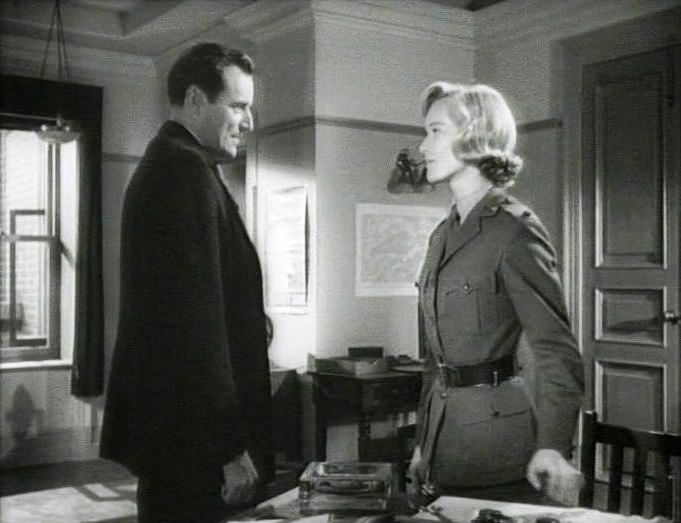 The film had a large cast including Kenneth More, Laurence Naismith, Honor Blackman and John Merivale. It featured a large number of scenes which worked together very well and captured convincingly the way of life and prevailing attitudes in the early years of the 20th century. It was heavily drawn on for the more ambitious 1997 Hollywood fim, "The Titanic". There were other memorable films not already mentioned in which Goodliffe had supporting roles or made "cameo" appearances. 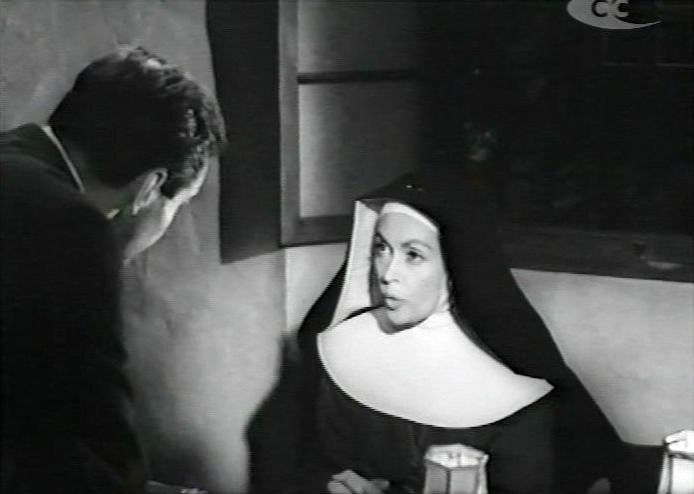 These include "The Small Back Room", "The End of the Affair" starring Deborah Kerr, "Peeping Tom" (which Goodliffe thought was in poor taste but which is now regarded as a classic), "The Battle of the River Plate", "The Fixer", "The Last Days of Hitler", "A Conspiracy of Hearts" (in which he played a priest who "turned the other cheek" when slapped by a German soldier - the slap broke Goodliffe's nose and he was paid £20 damages by the film company) and "The Gorgon". Again Goodliffe did not like this (or indeed any other "horror") film, although it seems to have aged quite well. 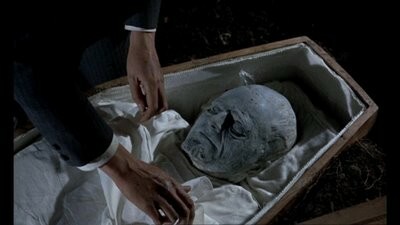 The scenes of Goodliffe's face turning to stone, his hands turning to stone while he writes his last letter and then in his coffin are quite memorable although the film uns out of steam in the second part. For a long time Goodliffe did not enjoy appearing on television. Transmission were usually live, there was strong pressure on budgets, and the quality of the picture was poor. He felt under particular pressure when appearing in series of programmes produced in quick succession, where the script was delivered late or late changes were made. Learning his "lines" was often a difficult exercise. Such problems may have been, for instance, one of the reasons why he dropped out of the series "Callan" after a few episodes. Interest in some of these "cult" 1960s productions has revived (e.g. "Callan", "The Avengers", "Z Cars", Randall & Hopkirk deceased", "The Saint", Man in a Suitcase", "Jason King"). 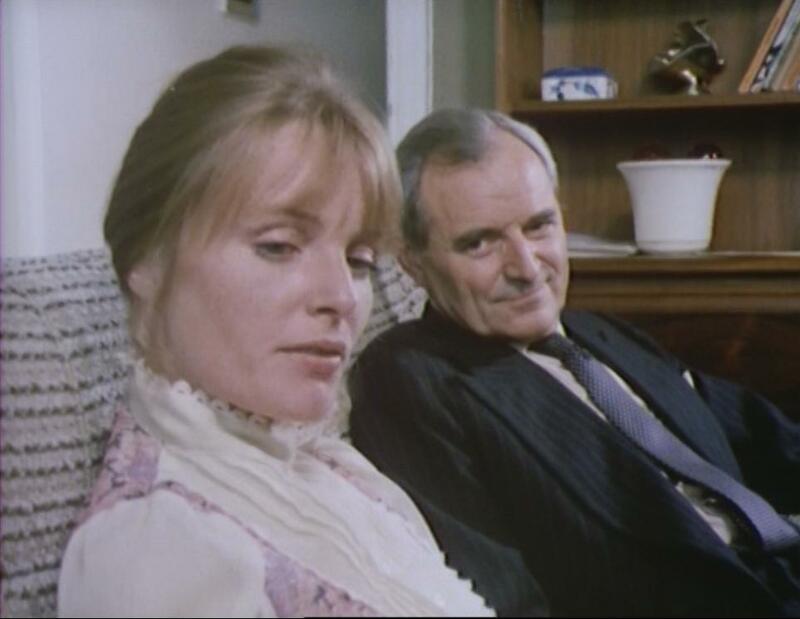 However, Goodliffe's best performances on television were in "dramatisations", often aimed at a worldwide market, for instance, of "Lord Mountdrago" and "The Lotus Eater", both by Somerset Maugham, "Inheritance" by Phillys Bentley with John Thaw and James Bolam, "Ironhand", "The Woodlanders" by Thomas Hardy with Felicity Kendal, and "Le Père Goriot" by Balzac in which he played the title role. None of these more literary productions are, alas, ever re-transmitted on TV or available on video or DVD - many of them have been lost. Most of them were produced in black and white. The quality of the picture compares poorly with modern productions. 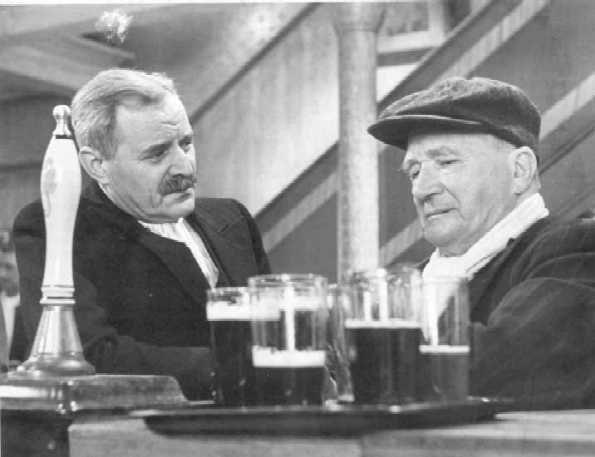 One of Goodliffe's last appearances was in Granada television's "Sam". This was a critically acclaimed television series running to 39 episodes. It was about a mining community in Yorkshire set in the 1930s. 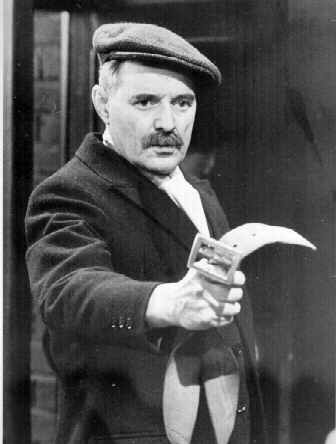 Goodliffe played the patriarchal grandfather, Jack. In some ways Goodliffe was cast against type, since he usually played professionals and spoke with a "posh" accent. On the other hand in a sense he was playing himself. Just as Jack could not come to terms with long term unemployment, Goodliffe himself could never adjust to the financial insecurity of being an actor. The series could also be regarded as the culmination of his career. It was the nearest he ever came to being a "star". He once remarked to John Finch, who devised and wrote the series: "It just seems a bit ridiculous that I should be in the business nearly forty years before landing a part like that." But he was very unwell by the time the series ended. Although successful and versatile, Goodliffe's career never quite realised its early promise. Like many others in his profession his apparent confidence and charisma concealed an overwhelming sense of failure. He also had periods of depression aggravated by a tendency to drink more than was good for him. He was admitted to the Atkinson Morley Hospital (then in Wimbledon) in March 1976 following a breakdown. He committed suicide there a few days later by jumping off the fire escape adjoining his ward. Two obituaries appeared in "The Times": one a few days after his death and a follow up by his co POW Victor Hellaby on 1 April 1976. 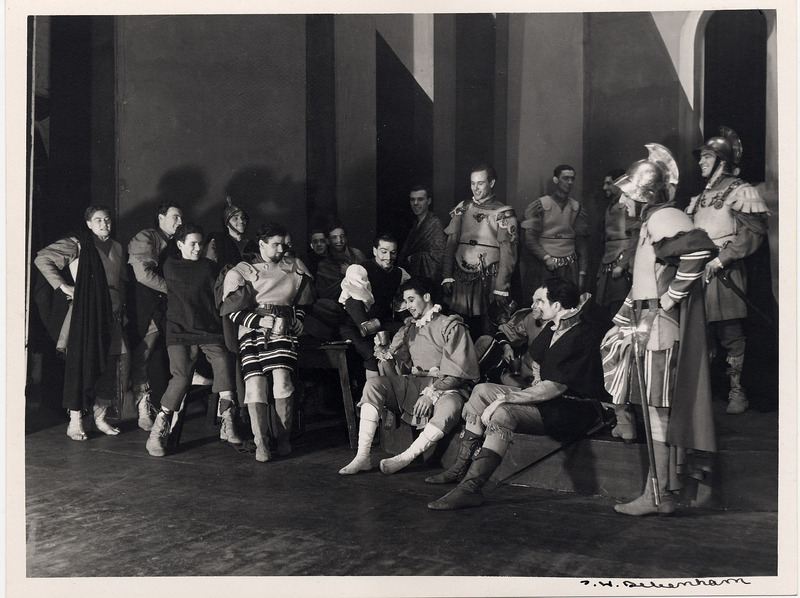 Othello 1938, Old Vic. 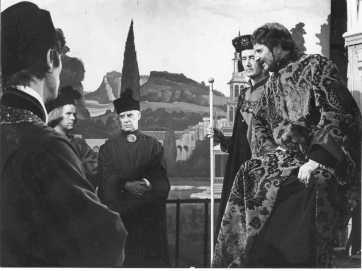 Laurence Olivier in the title role. 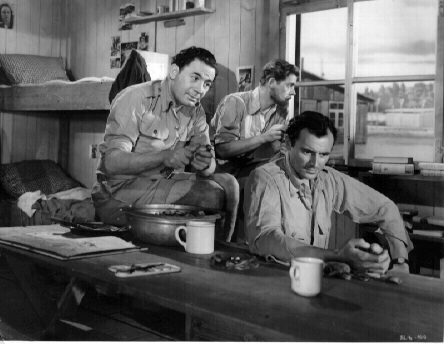 A still shows him with Anthony Quayle, Goodliffe (as Montano) looking away from the camera on the right. Also a photograph from the rehearsals with, from left to right, Stephen Murray, Olivier, Goodliffe, Tyrone Guthrie and Timothy Lynn Kearse embracing Anthony Quayle. 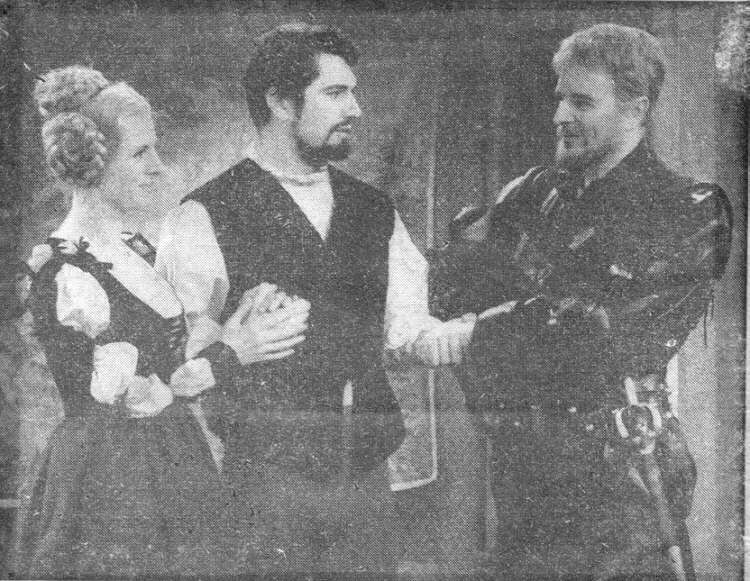 2 unidentified members of the cast on the right. The Circle, by Somerset Maughan, 1945 (still in the army). While on tour in Europe in this production heard the news of VJ Day. 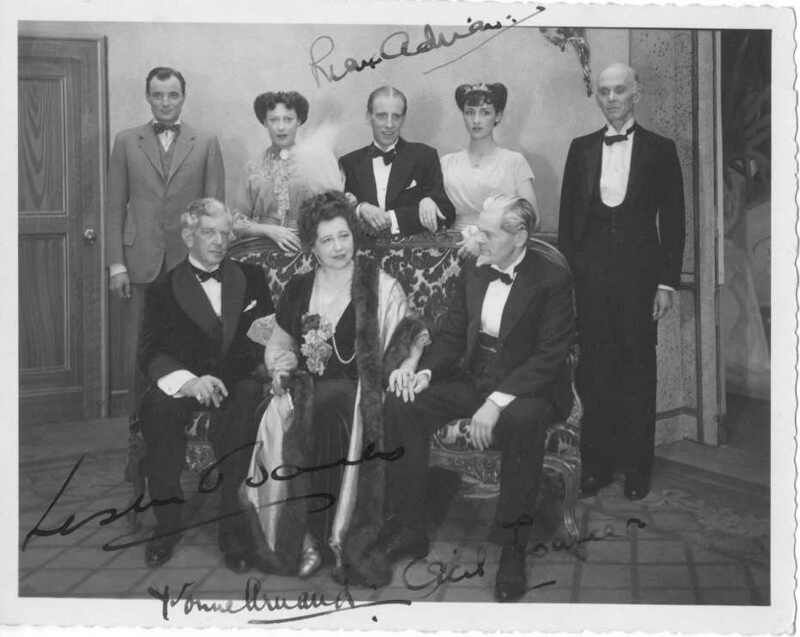 With (front row) Leslie Banks, Yvonne Arnaud, Cecil Trouncer (back row) , Michael Goodliffe, Noel Dyson, Max Adrian, Rosalie Crutchley and Francis Drake. Leslie Banks was one of Goodliffe's early mentors. Further photo with Rosalie Crutchley and Leslie Banks. 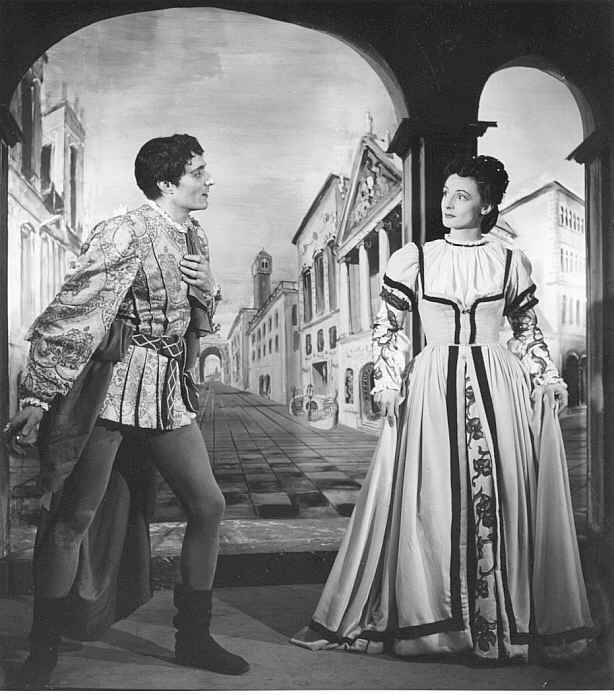 Romeo and Juliet, 1946, King's Theatre Hammersmith, as Benvolio with Edna Hazell? or Daphne Newton? or this may be a still from the television production in 1947 in which case the actress is probably Rosalie Crutchley. The record of that production is in any event lost from the BBC Archives. 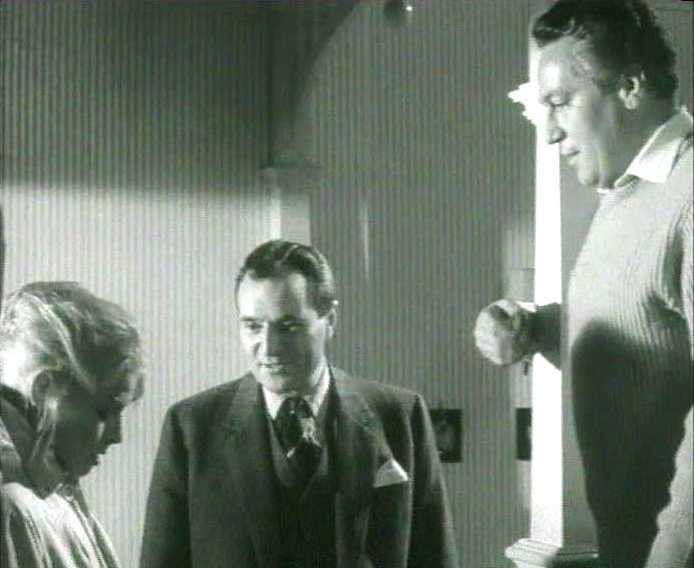 The Small Back Room, 1949, with Sam Kydd, Robert Morley and Milton Rosmer (still by Anthony Hopking). Goodliffe's first film. Still very exciting viewing. 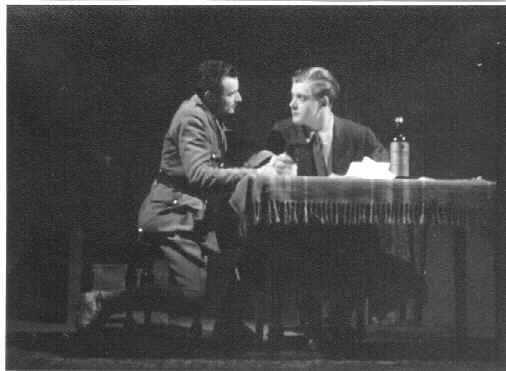 The Wooden Horse, 1950 with Leo Genn and Dan Cunningham, playing POWs (Dan having been with Goodliffe at Eichstätt in the 1940s (see "Post Mortem" above). 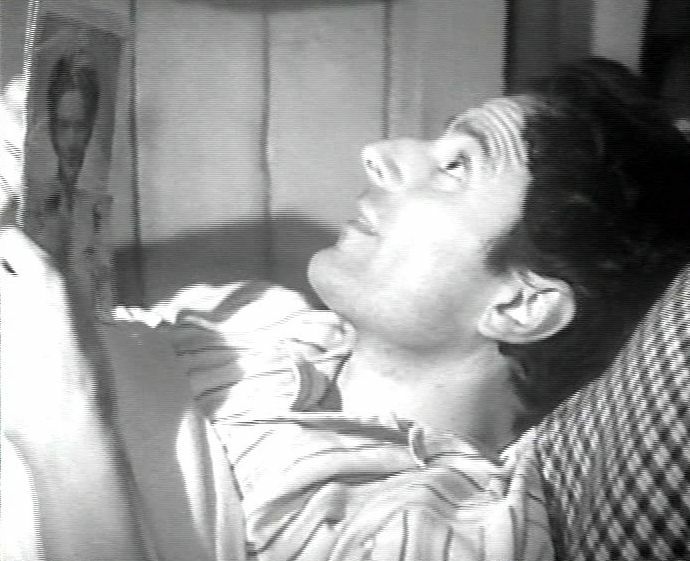 Second photo showing Goodliffe playing the same POW in his bunk in the opening sequence with a picture of Goodliffe's real life wife Peggy. 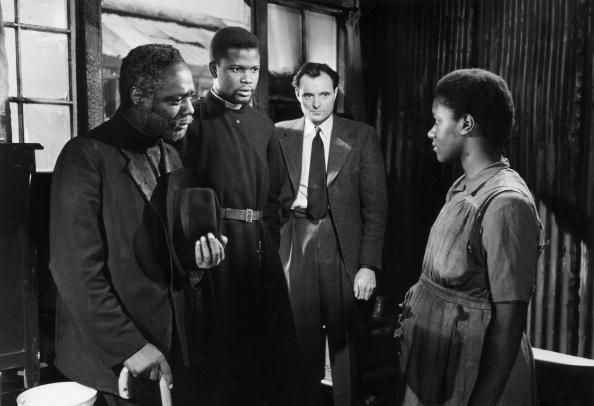 Cry the Beloved Country, with Canada Lee, Sidney Poitier, and Vivien Clinton, 1951, filmed on location in South Africa. The author of the book, Alan Paton, was closely involved in the production. A moving film which must have been made in very difficult circumstances. Most of the black actors were amateurs (by necessity no doubt) and few of the mostly British white actors made any attempt at South African accents (Vivien Clinton, who played a 16 year old prostitute, also spoke with a public school accent). Seems now rather old fashioned and patronising in its approach to race issues. In most respects the remake in 1995 was an improvement (especially James Earl Jones' portrayal of the leading part) and drew on the best aspects of the original version, although most of the smaller parts lost time on screen at the expense of the starring roles. In the original version the father (Charles Carson) of the murdered man shakes hands with the black men at his son's funeral. In the 1995 version he (Richard Harris) does not. Carve her name with Pride, 1950s with Virginia McKenna. Goodliffe plated a coding expert. The End of the Affair, 1950s. 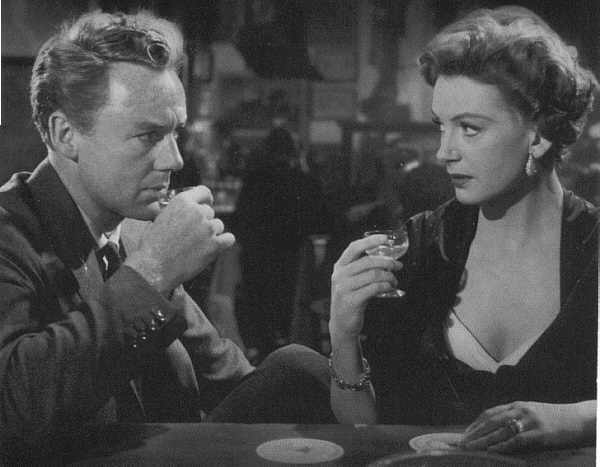 Still featuring Deborah Kerr and Van Johnson and freeze frame showing Goodliffe with Deborah Kerr. Recently remade. Earlier version more convincing in my view, despite apparent lack of chemistry between Johnson and Kerr. The River line, 1952. 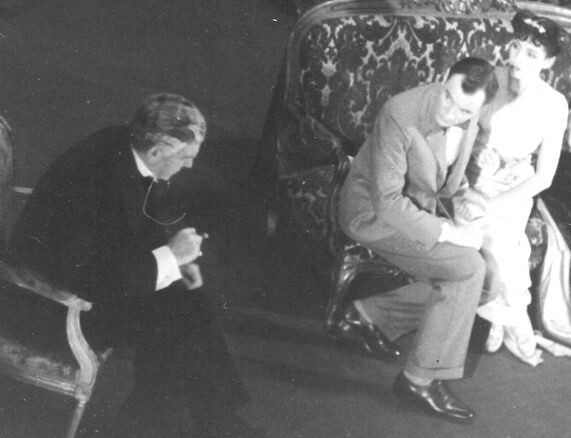 Photo shows, from left to right, Goodliffe, John Westbrook, Pamela Brown, Robert Hardy, and Paul Scofield. Virginia Mckenna also appeared in this production. "The River Line" was originally a novel by Charles Morgan which he adapted for the stage. The play described how 3 escaped prisoners of war during WWII were sheltered by a French family in Toulouse. One of them (played by Westbrook) wrongly suspected of being a German spy attempting to track the "River Line" of French Resistance agents, is killed by the another (played by Goodliffe) as illustrated in the photograph. 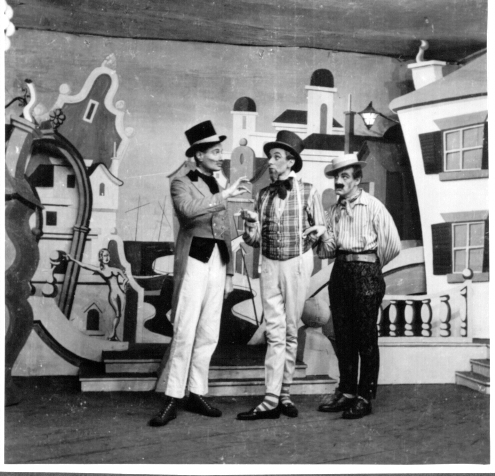 The play was subsequently adapted for television (Goodliffe did not appear) and later adapted by Herbert Reinecker into a German film, "Kennwort - Reiher". Morgan's plays now seem very old fashioned and intellectual. However, "The Riverline" was revived in 2012 in a London fringe theatre. Front Page, 1954, playing a hack journalist with Jack Hawkins as the editor. 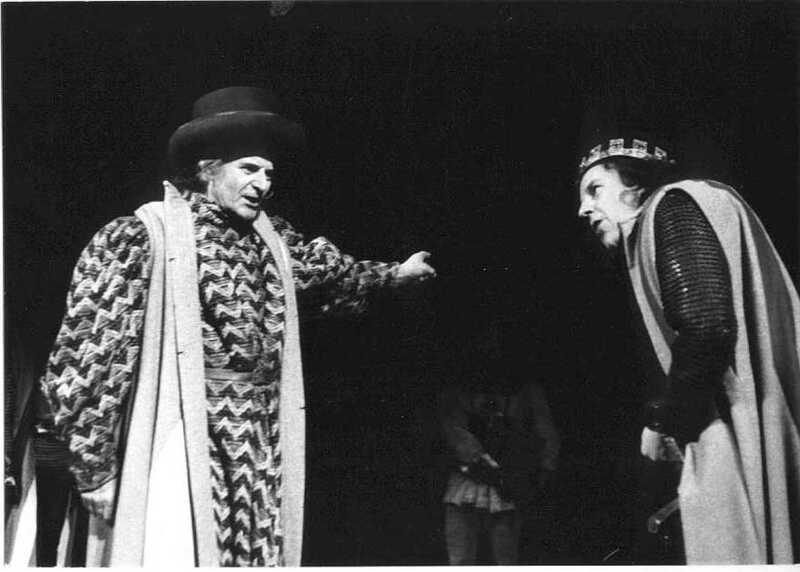 Rob Roy, 1954, as Sir Robert Walpole, with Michael Gough as the Duke of Montrose. A Walt Disney film starring Richard Todd in the title role.. The One that Got Away, with Hardy Kruger, who played Franz von Werra (who escaped from capitivity in Canada during WWII), 1957. 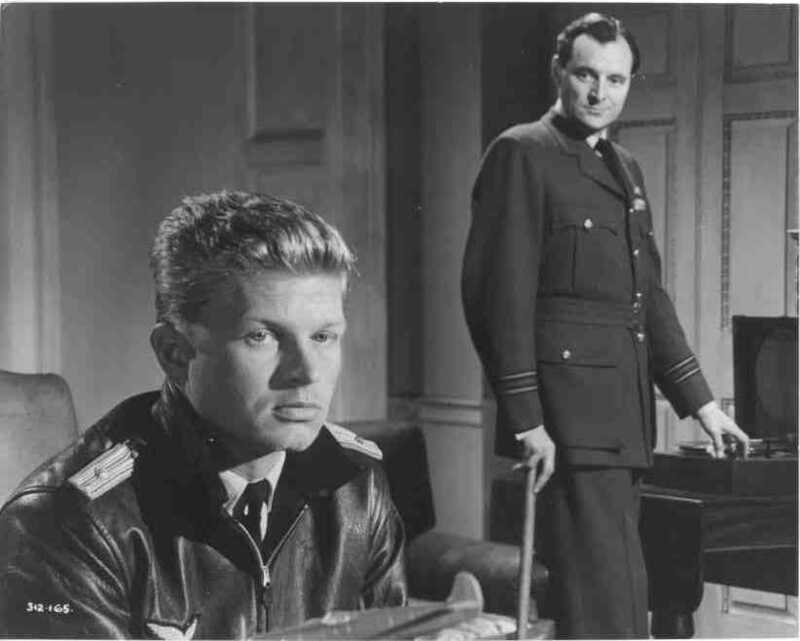 Goodliffe played a British Air Force officer who interrogated von Werra. After his escape, Von Werra visited a prisoner of war camp where Goodliffe was held during the war (I cannot remember which one) to advise the German guards on how to deal with escape attempts. The Invisible Man, 1950s, a television series. Here Goodliffe is shown hitting the invisible man over the head with a bottle. 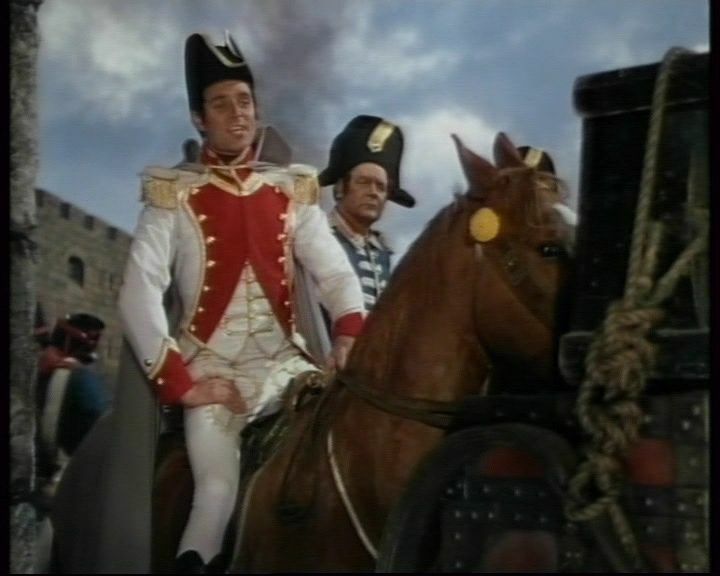 Captain Hornblower RN, 1951, as scornful French colonel. Gregory Peck played the title role and US actors the other main roles. CS Forester, the author of the book took part in the production. 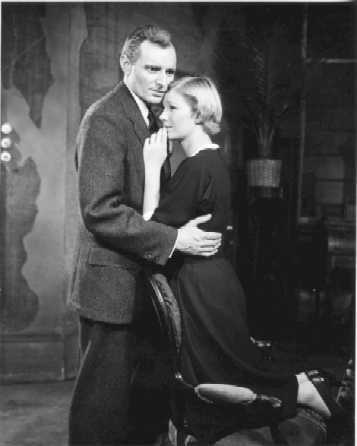 The Burning Glass, by Charles Morgan, 1954, Apollo Theatre, London, with Faith Brook. 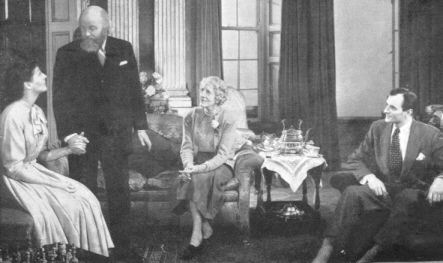 Second still with Faith Brook, Laurence Naismith and Dorothy Green. Has dated less well than "The River line" (see above). 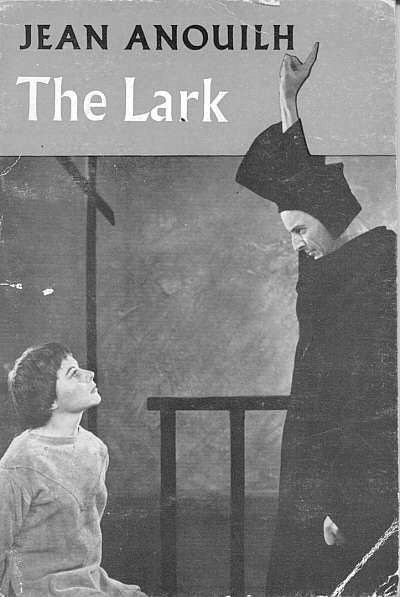 "The Lark" by Jean Anouilh, 1955 with Dorothy Tutin as Joan of Arc, Goodliffe playing the Inquisitor. 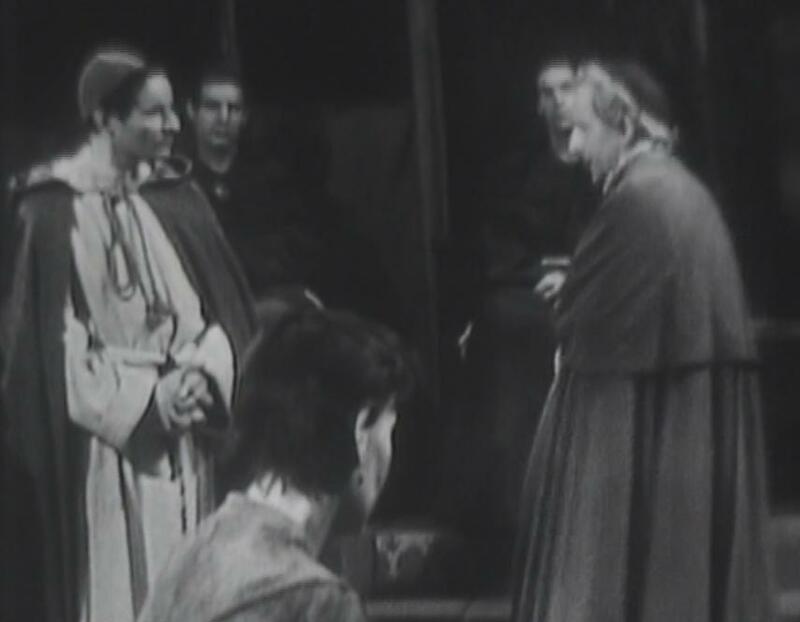 The play was televised the following year with Hazel Penwarden as Joan and Goodliffe again as the Inquisitor. This play has been preserved in the BBC archives and makes very compelling viewing. This is despite, or even possibly because, of the shadowy picture quality. 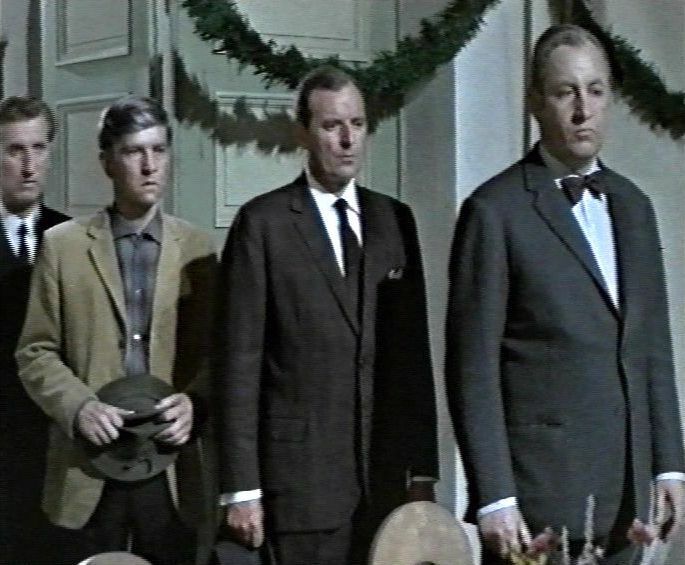 See freeze frame showing Goodliffe, Penwarden and Robert Harris as Cauchon. There is also a US movie for TV of the play made in 1957 with Julie Harris as Joan and Basil Rathbone as the Inquisitor. 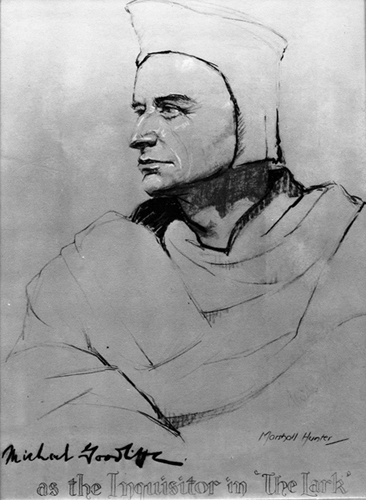 The play has inspired a number of artists. 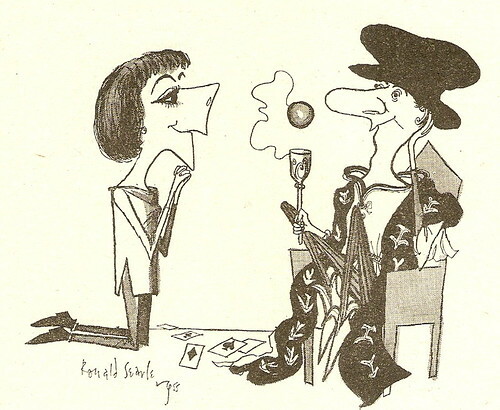 These include Edinburgh artist Marshall Hunter (1905-1979) who produced a drawing of Goodliffe as the inquisitor, Anthony Devas' painting of Dorothy Tutin as Joan, Ronald Searle's caricature of Tutin as Joan with Donald Pleasence as the Dauphin, a painting (artist unkown) of Julie Harris as Joan, featured on the front page of "Time" Magazine and a picture of Sara Giraudeau as Joan made up in the style of a stain glass window..
Battle of the River Plate, 1956, playing the naval attaché at the British Embassy in Montevideo with Anthony Quayle as the Captain of a ship hunting down the German Battleship Graf Spee. Fortune is a Woman, 1957, with Arlene Dahl. Wicked as They Come, 1957. The whole of this film can now be watched on Youtube, although it is hardly worth the effort. 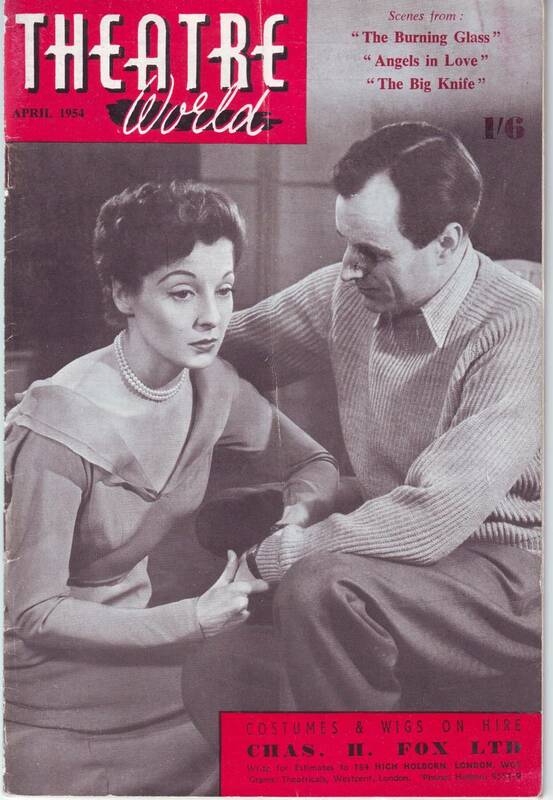 It features two torrid scenes with Goodliffe declaring his love for the stunning Arlene Dahl. 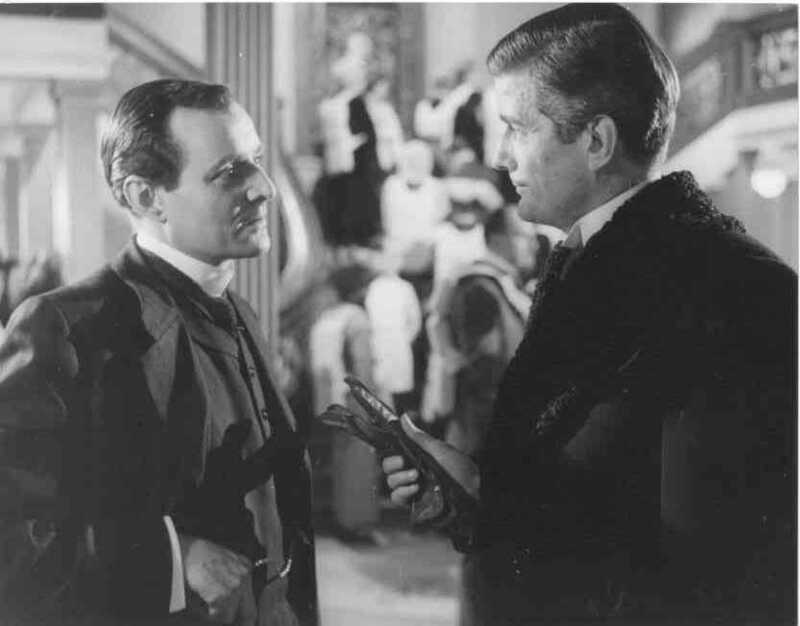 Night to Remember, playing Thomas Andrews, the architect of the "Titanic" with John Merivale, 1958 (both being frightfully British about the prospect of the "Titanic" sinking). A second still from this film shows Andrews just before being drowned in the sinking, not looking quite so British. Goodliffe's best known film. 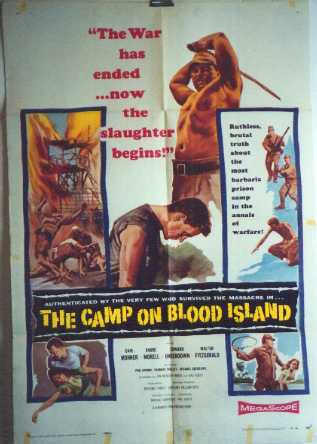 Camp on Blood Island, 1958, Hammer Films. Very lurid and brutal (but said to be good of its genre) and parodied by Monty Python. I remember the poster but did not see the film until its recent release on DVD. Still shows Goodliffe with Barbara Shelley and others. 39 Steps, 1959 with Kenneth More, Taina Elg and Duncan Lamont. Always unfavourably compared with the earlier version starring Robert Donat. Battle of the Sexes, 1959 with William Mervyn. 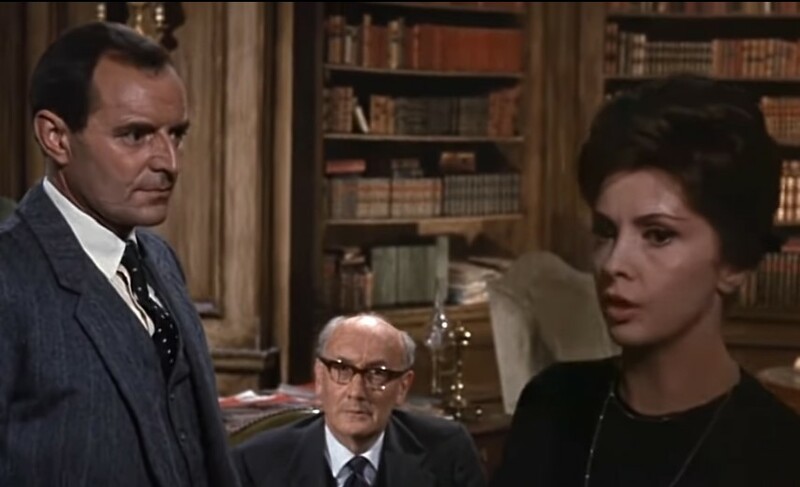 Goodliffe and Mervyn are playing in a "film within a film" and being watched by Peter Sellers who is inspired by the film to go out and murder Constance Cummings. Cummings is tormenting Sellers by intoducing modern management methods into the business in which they work. Julius Caesar, BBC Schools, 1960. 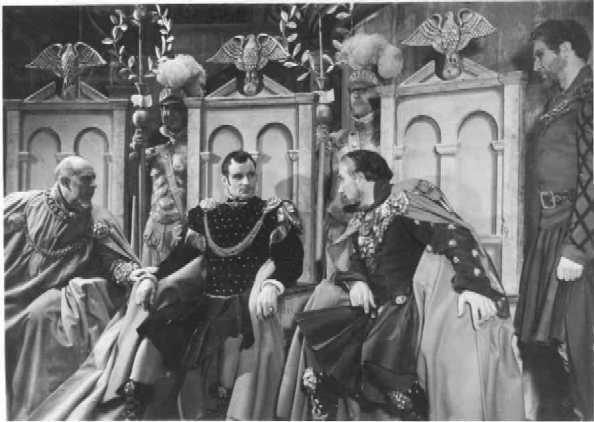 Stills show Goodliffe playing Brutus with John Laurie as Cassius, James Maxwell as Mark Antony and Ralph Michael as Caesar. This play is preserved in the BBC archives. 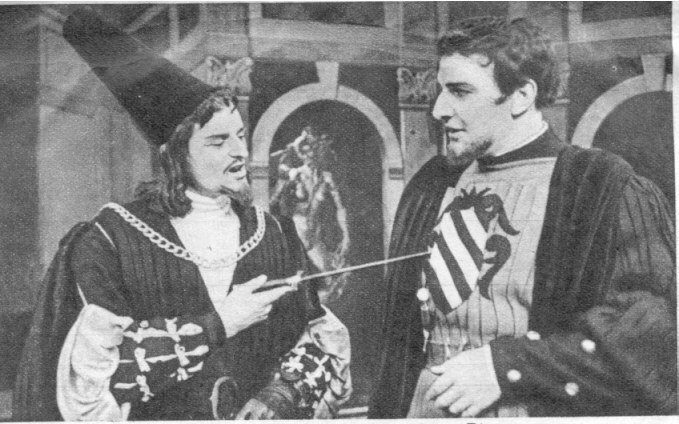 As far as I know this is the only TV or film recording of Goodliffe in a Shakespeare play. 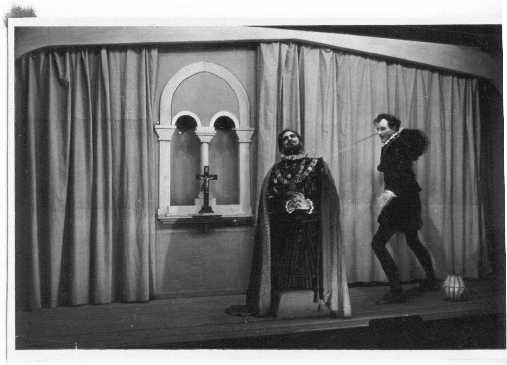 There are however radio productions in which he took part including Macbeth and Henry V.
Peeping Tom, 1960 with Veronica Hurst. Playing a ruthless film producer. Goodliffe had a very poor opinion of this film but it is now regarded as a classic. 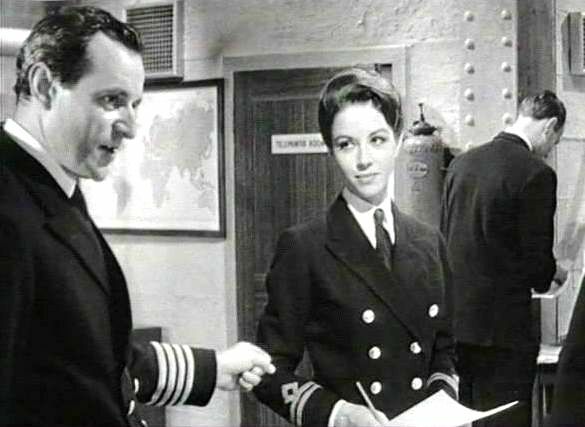 Sink the Bismark!, 1960, with Dana Wynter. Conspiracy of Hearts, 1960, with Lilli Palmer and being beaten up by Peter Arne with Ronald Lewis on the left. 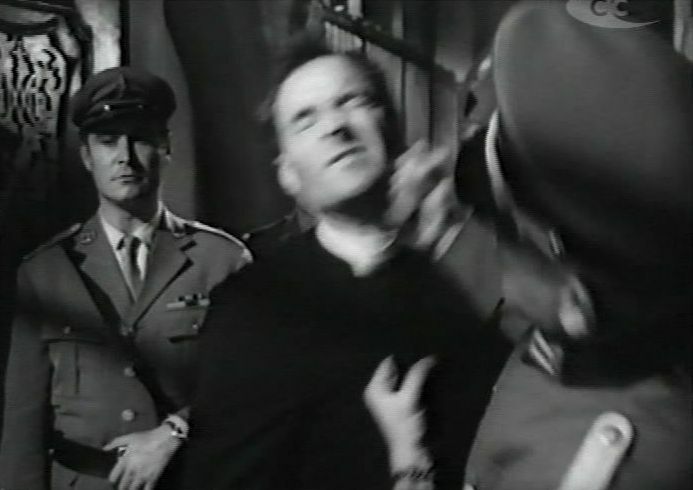 Goodliffe played a Catholic priest who was slapped by a German Officer and then turned the other cheek to be hitten again (as shown in the photo). The slap broke his nose and he was paid £20 damages by the film company. This was a film about nuns in Italy saving Jewish children and being treated brutally by the Germans. It is actually quite good, although it was spoilt for many by tasteless marketing. See my page devoted to this film. 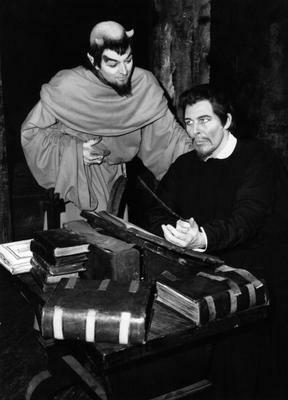 Rehearsing the part of Mephistopheles for Marlowe's Dr Faustus at the Edinburgh Festival, 1961-2 with Michael Benthall, the director. Further still with Paul Daneman in the title role. This production started at the London Old Vic. 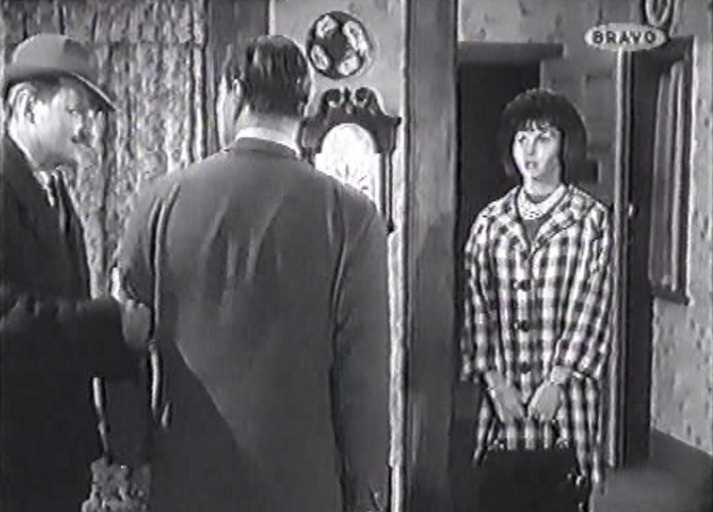 No Love for Johnnie, 1961 with Mary Peach and Peter Finch. Finch played an ambitious and ruthless politician. Peach was his girlfriend and Goodliffe her father - unaware of their relationship. Finch's portrayal of this anti-hero part was much admired and imitated. This is another film that Goodliffe had a poor opinion of but which is now regarded as a classic. 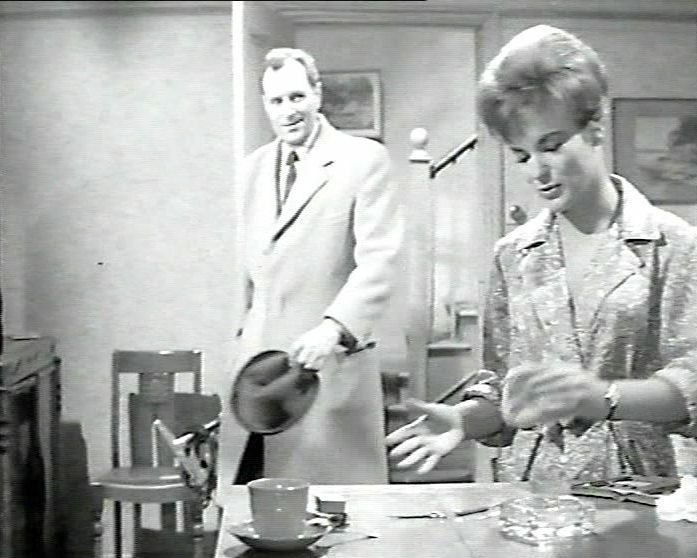 Jigsaw, 1961 playing a lecherous vacuum cleaner repair man, with Moira Redmond. Second photo with Jack Warner and Ronald Lewis. Very old fashioned but original and interesting. 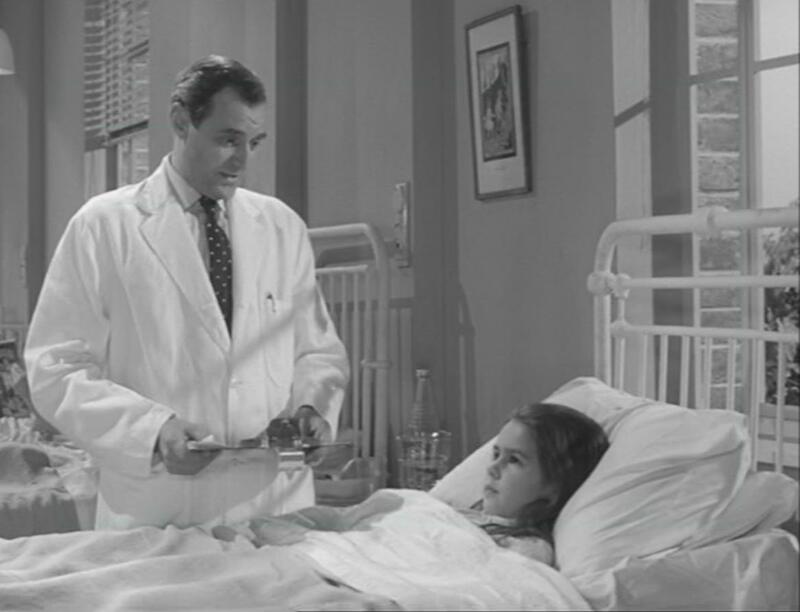 Number Six, 1962, with Ivan Desny and Nadja Regin: in the "Edgar Wallace" television series. 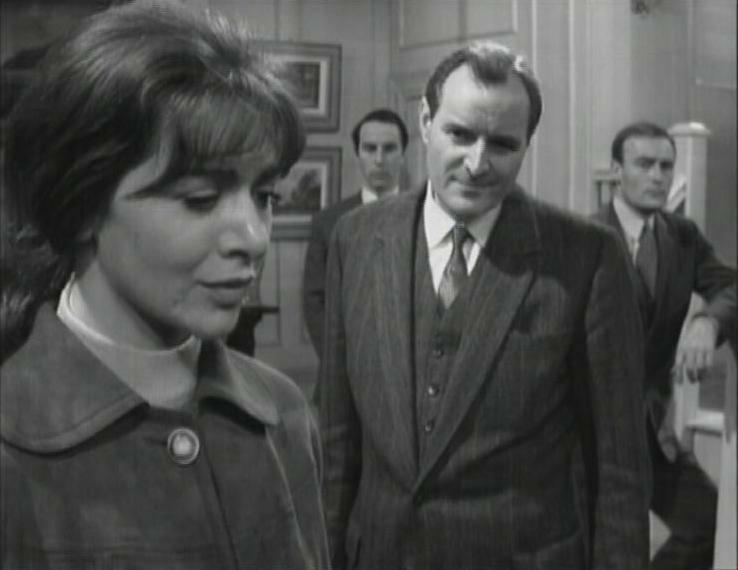 80,000 Suspects, 1963 with Claire Bloom (picture is colour but film was black and white). Dreary film about an epidemic and one doctor (Richard Johnson) sleeping with another doctor's (Goodliffe) wife (Yolande Donlan). Also featured Cyril Cusack. 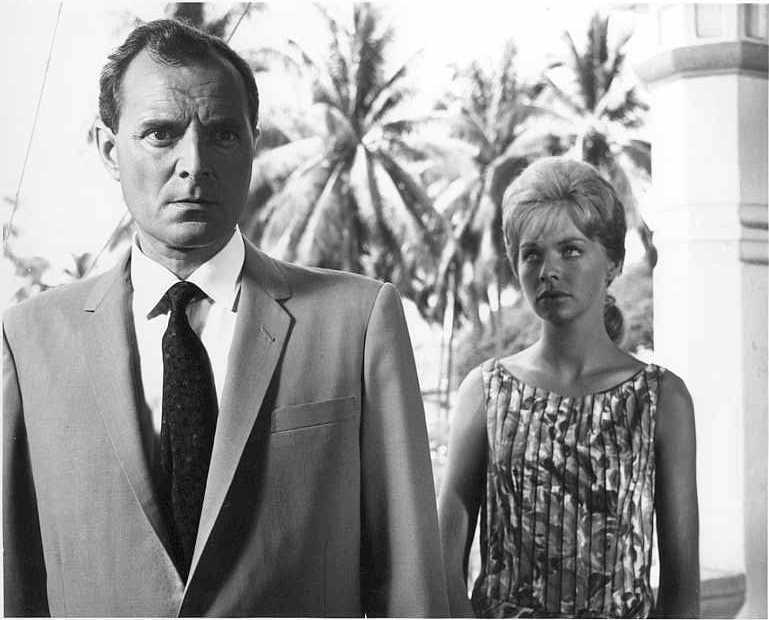 Seventh Dawn 1963 (shot in Malaya - as it then was) with Susannah York. Further photo with Capucine. A very dull high budget film starring William Holden. 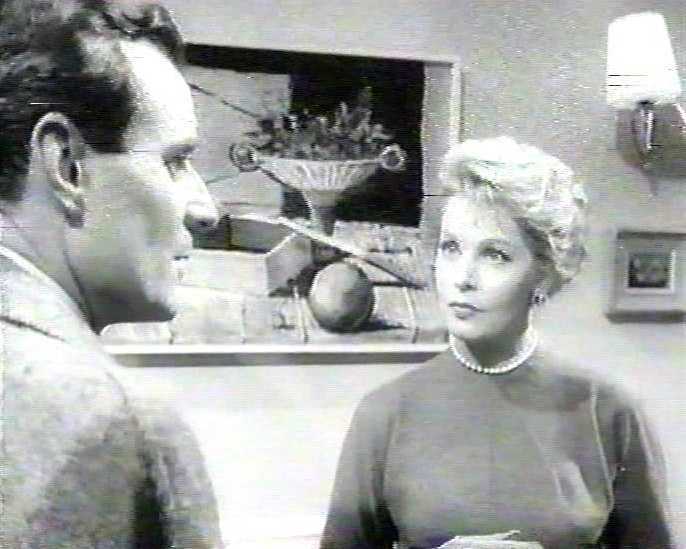 The most improbable scene features the 21 year old Susannah York seducing the 45 year old William Holden. 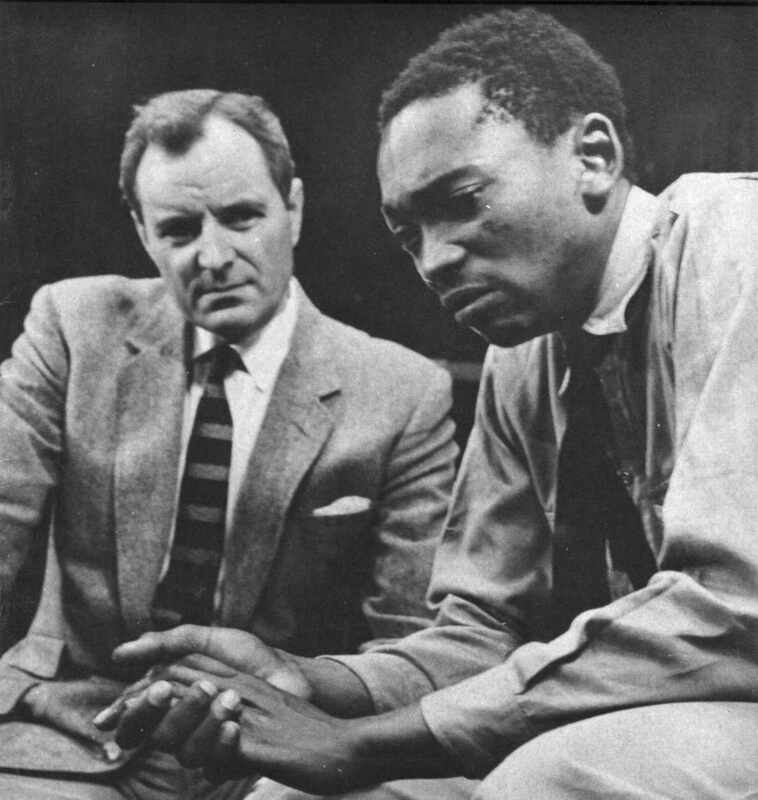 Sponono, 1963, Broadway, New York, with Cocky Tlhotlhalemaje who played the title role. Second photo with Vinah Bendile. Goodliffe is plunging his hand into boiling water to prove that he is telling the truth while Bendile dances. The play was based on a series of short stories featuring a reform school boy, Sponono. 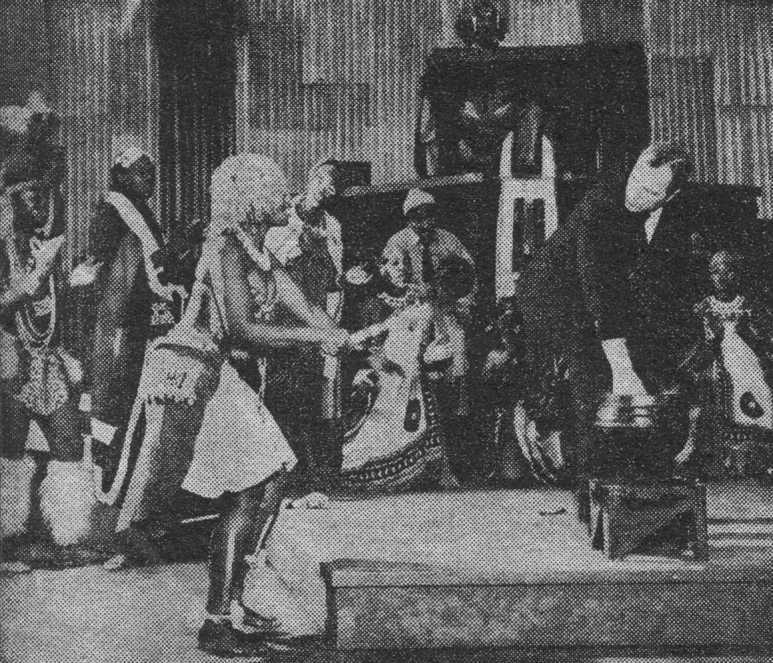 Although successful in Durban (before Goodliffe's involvement) the play failed on Broadway. In his forward to the play, published in 1983, Alan Paton (co-author with Krishna Shah) remarked that the sophisticated black audiences in America saw the white principal of the reform school (played by Goodliffe) "as a creature of the colonial past of Africa". Paton, however, maintained that the play "was a story of human relations, not race or colonial relations". 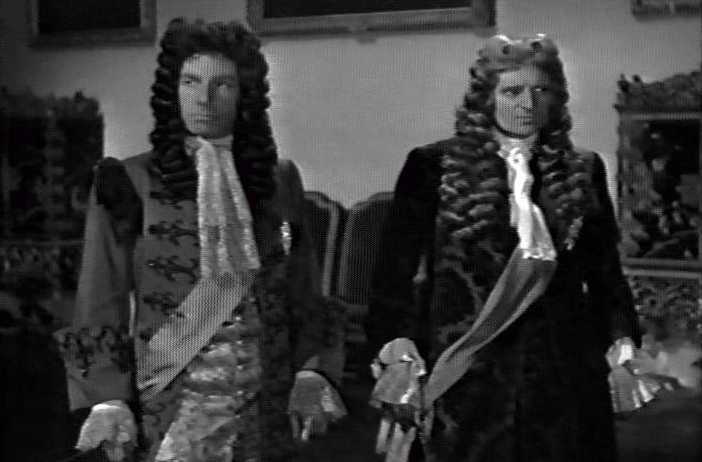 Mr. Douglas 1964, a television "Wednesday Play" in which Goodliffe played a run down Bonnie Prince Charlie who returned to England for the Coronation of George III in 1761. The Saint, 1962 with Roger Moore as Simon Templar, "The Saint". 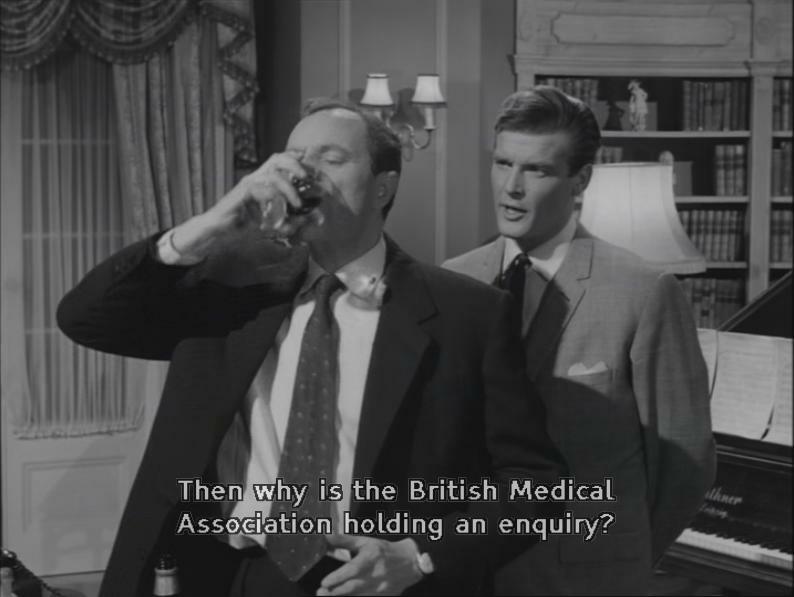 Moore has just unmasked Goodliffe as an alcoholic doctor under investigation by the General Medical Council. Goodliffe is having a large scotch to illustrate the point. Second still, with Katherine Blake and Jane Asher. 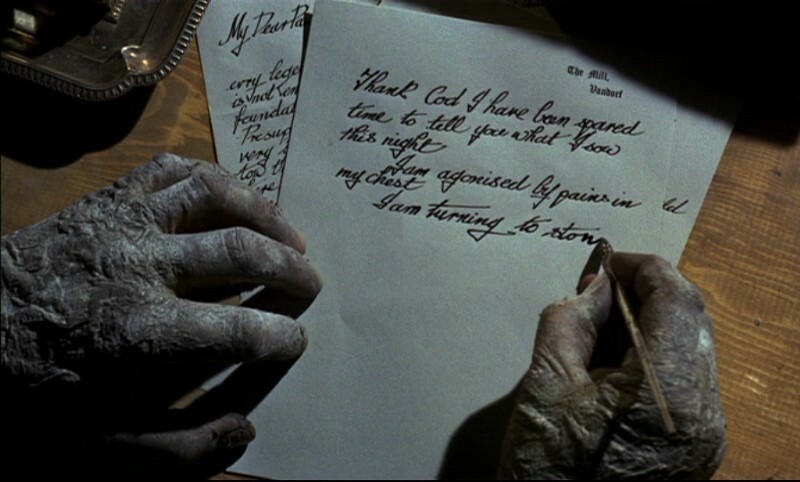 The Gorgon, 1964 (about to see the Gorgon), a few minutes later (seen the Gorgon and turning to stone), his hands turning to stone while he writes his last letter and later on (fully turned into stone and in his coffin). One of the great scenes in horror films. A Stitch in Time, 1963, with Lucy Appleby, then a child actress. She still performs and writes for the London stage. This was a Norman Wisdom film. Von Ryan's Express, 1965, still showing, left to right, John Leyton, Frank Sinatra, Sergio Fantoni, Goodliffe, Edward Mulhare and Trevor Howard, and a scene from rehearsals, showing in the foreground, Frank Sinatra, Adolfo Celi and Sergio Fantoni. 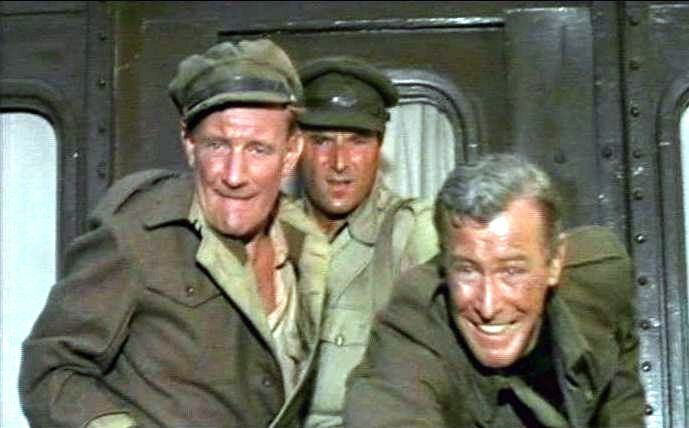 Closing shot with Trevor Howard and Edward Mulhare. The Avengers (The House that Jack Built) 1966, playing a mad scientist tormenting Diana Rigg from beyond the grave. See also Avengers cult web site. 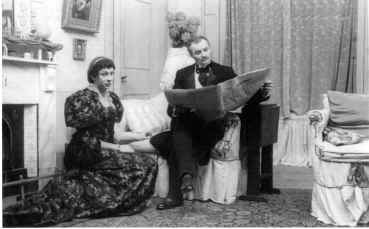 The Connoisseur, 1966 with Derek Francis, a "Wednesday Play" broadcast on television, covering homosexuality at an English public school. The "Radio Times" commented: "Specific psychological reasons for homosexuality are now pretty well accepted by thinking people. Environmental reasons for it do not seem to be of such consequence, though governors of prisons obviously contend with it, as indeed most seminarists and members of monastic orders, though these last are doubtless better equipped to cope." 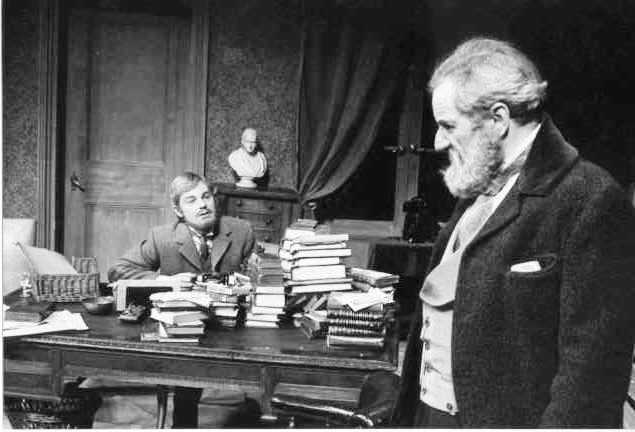 Le Père Goriot, 1968, playing the title role (series was in colour although still is in balck and white). This was a quite an ambitious television series directed for the BBC by Paddy Russell. Anna Cropper, David Dundas and Moira Redmond also appeared. 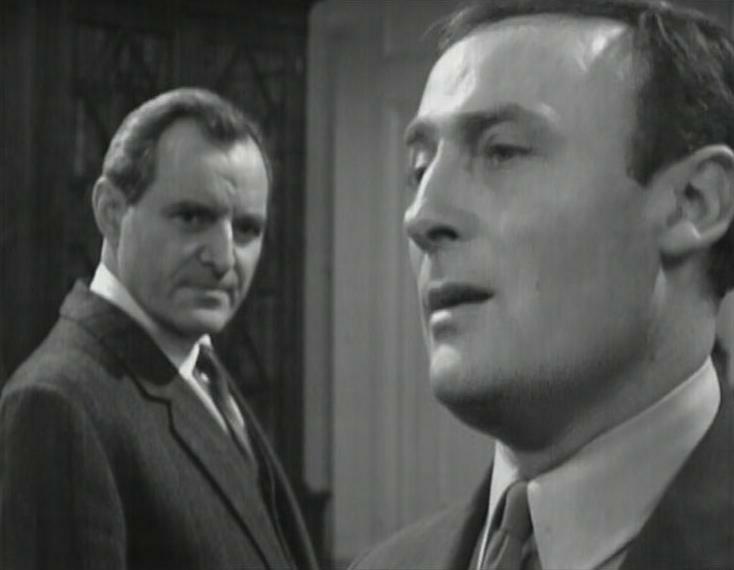 Callan, 1967 with Elizabeth Bell, Anthony Valentine and Edward Woodward. 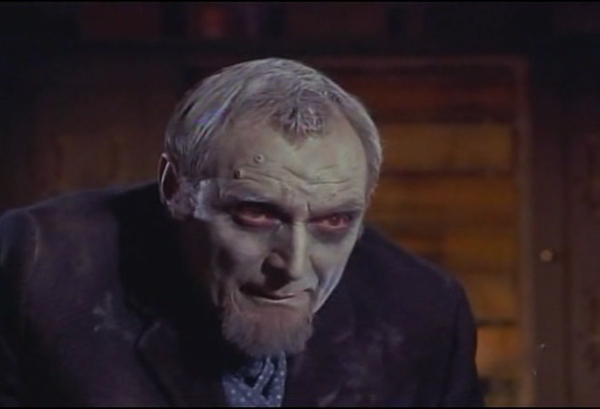 Second image of closeup with Edward Woodward. This was a television series featuring the most ruthless aspect of the secret service. 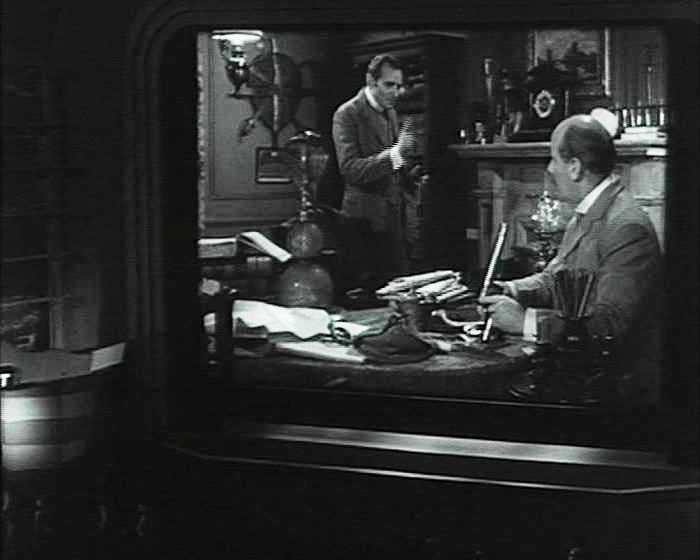 It required the maintenance of a constant tension on screen between Goodliffe and Woodward. 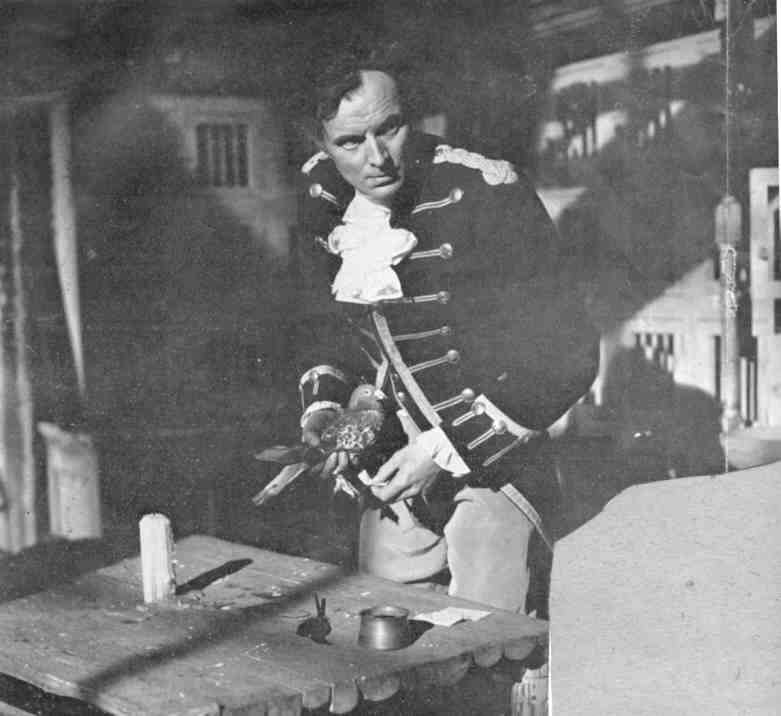 Goodliffe (who was the second of three actors playing his role) withdrew from the series after 5 episodes and had to be "killed off" in an episode called "Let's kill everyone". This started with the suicide of a Russian spy being "interrogated" by the secret service and was followed by three people (including Goodliffe) being shot dead by a gun, one being poisoned with a gas pellet and another drowning after being drugged. 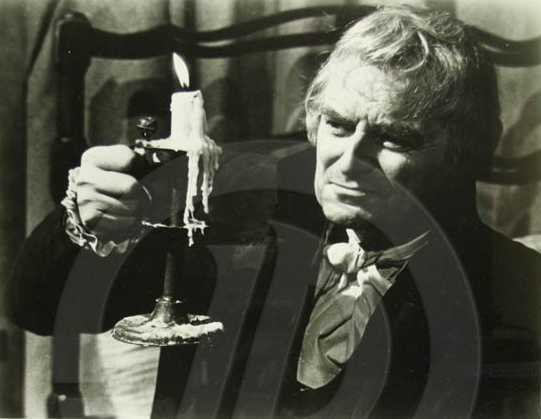 Perhaps the script writer, Ray Jenkins, was inspired by Shakespeare's Hamlet. 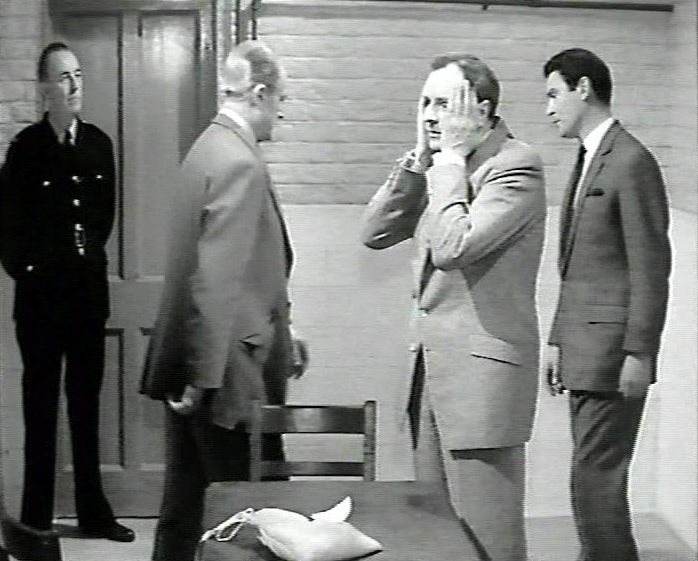 The series has recently been released on DVD under the name "Callan - the monochrome years". The monochrome series was followed by a colour series and a film. Howard's End. 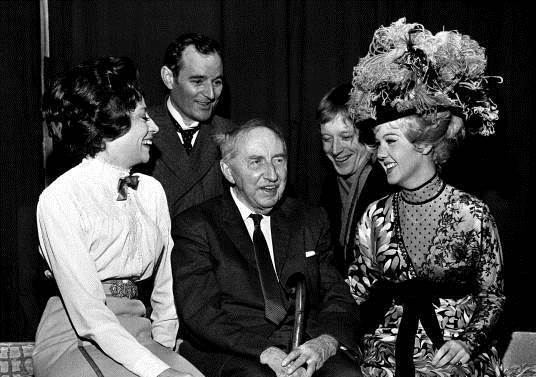 1967 Photo shows Goodliffe, EM Forster, Gwen Watford, Joyce Carey, Andrew Ray and an unidentified actress. Produced for the theatre by the 7th Earl of Harewood and directed by Frith Banbury. Forster himself helped with the production. The production was not a commercial success. 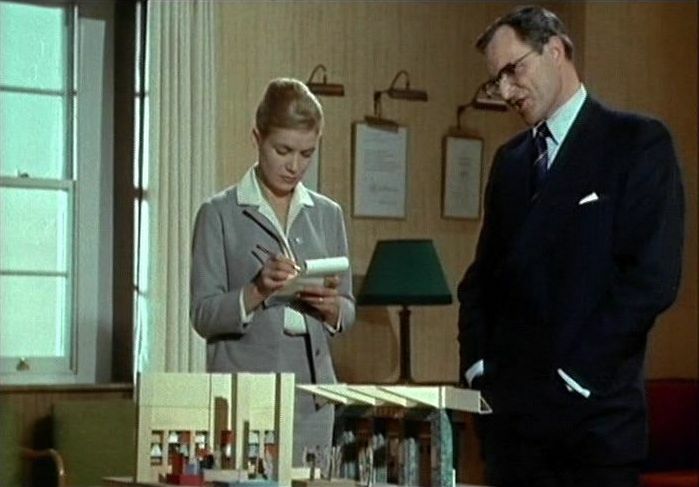 Inheritance, 1967. still shows him with James Bolam. This was a television series based on three historical novels by Phyllis Bentley. It featured succeeding generations of a Yorkshire mill owning family, starting with the Luddite riots in the early 19th Century. Goodliffe spent much time learning how to speak with a Yorkshire accent (Lancashire came to him more naturally) and played the father with John Thaw playing his eldest son (still shows John Thaw and Thelma Whiteley) and James Bolam sometimes playing the younger son. There was, indeed, some resemblance in facial features and general appearance between Goodliffe and Thaw. The series helped to turn the expression "There's trouble at t'mill!" into a catchphrase. 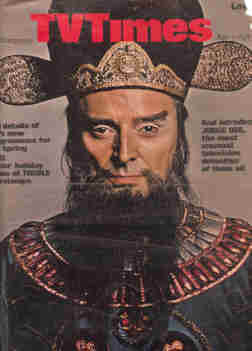 Judge Dee, 1969, a television series featuring an ancient Chinese examining magistrate. 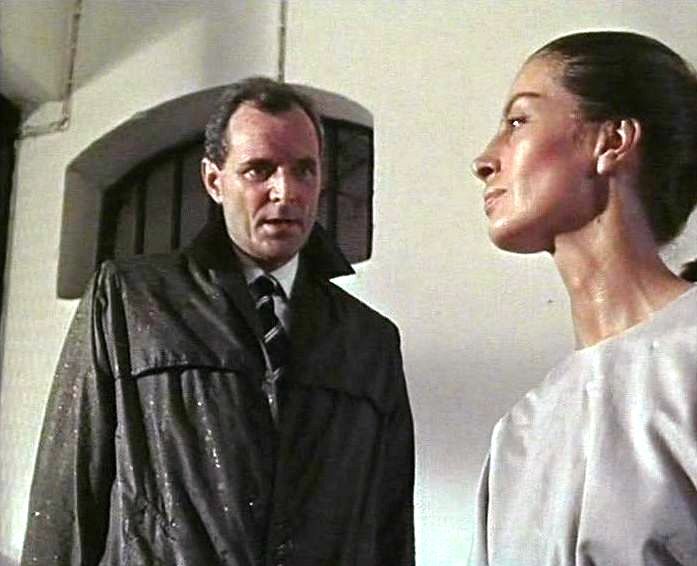 A recent reference to this series in the Radio Times said "Thanks to the resolutely British casting - Michael Goodliffe as the judge for example - this short lived drama series was unintentionally hilarious". 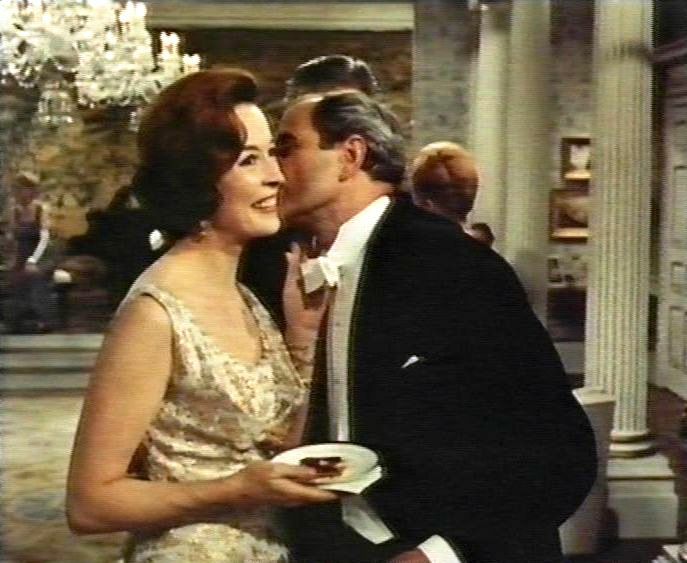 Man in a Suitcase, 1960s, shown kissing Barbara Shelley. This shot is the only good thing in an otherwise rather dull 1960s television series. The Canterbury Tales, for BBC Television, 1960s. Randall and Hopkirk Deceased, 1960s with Annette André. Second photo being arrested by Mike Pratt. This television series has recently been remade. 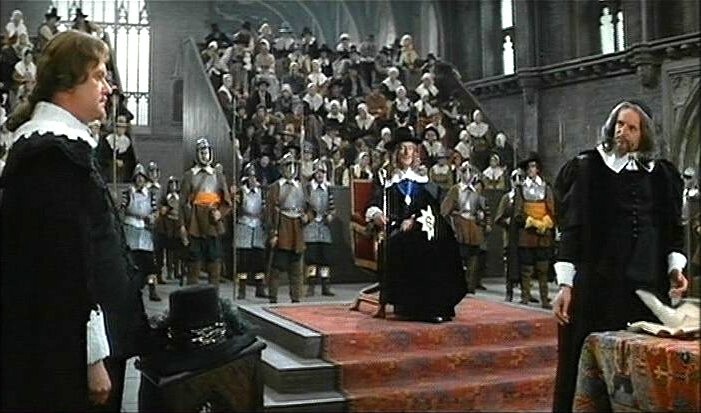 Cromwell, 1970, playing the Solicitor General at the trial of Charles I, with Nigel Stock as Edward Hyde on the left and Alec Guinness as the king in the middle. 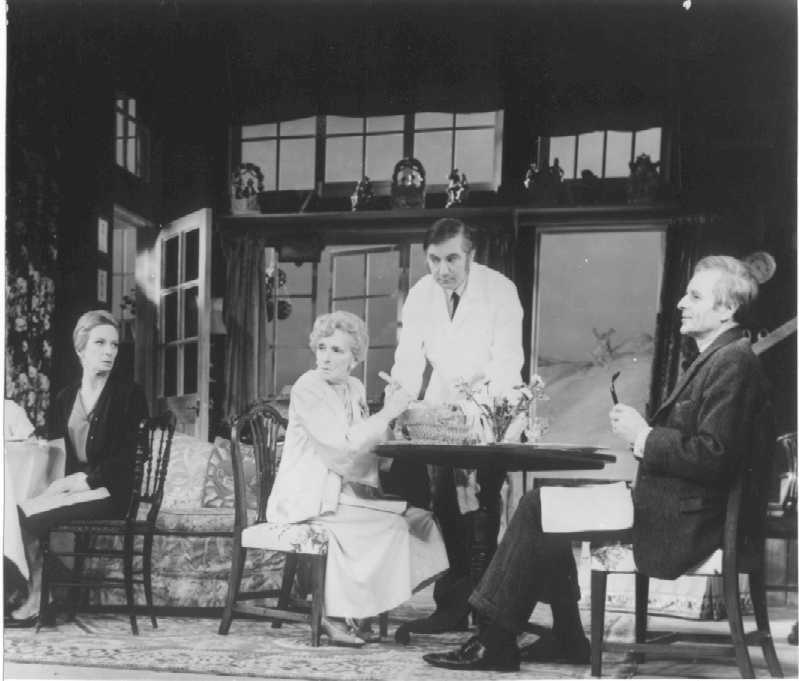 Chalk Garden, (by Edith Bagnold) Haymarket Theatre, London, 1971 with Vanessa Miles, Joan Greenwood, Gladys Cooper, and Peter Bayliss. A very decadent but amusing and popular play. 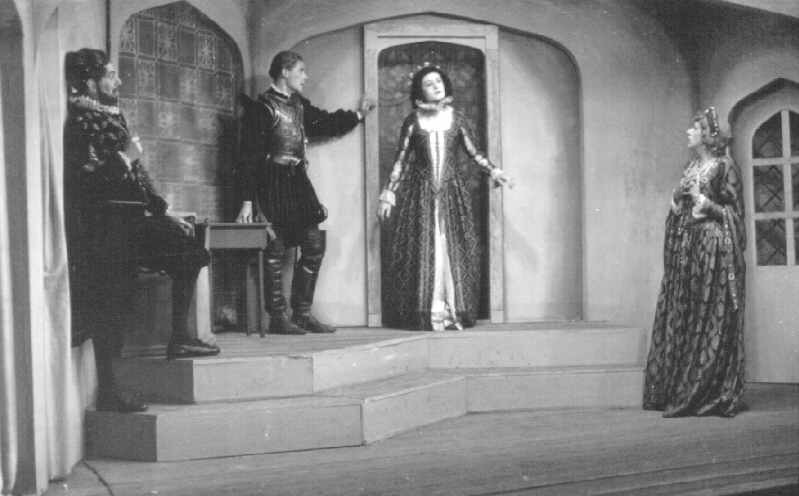 Last performance on stage by Gladys Cooper. 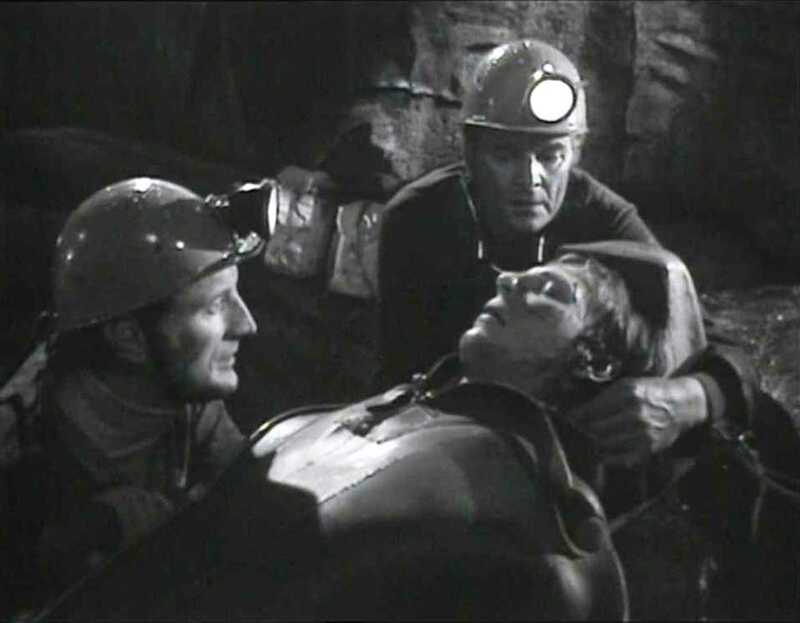 Hadleigh, 1971 with Gerald Harper and Kenneth Cranham: Cranham injured in caving accident Goodliffe playing doctor trying to keep him alive with Harper keeping up his morale. 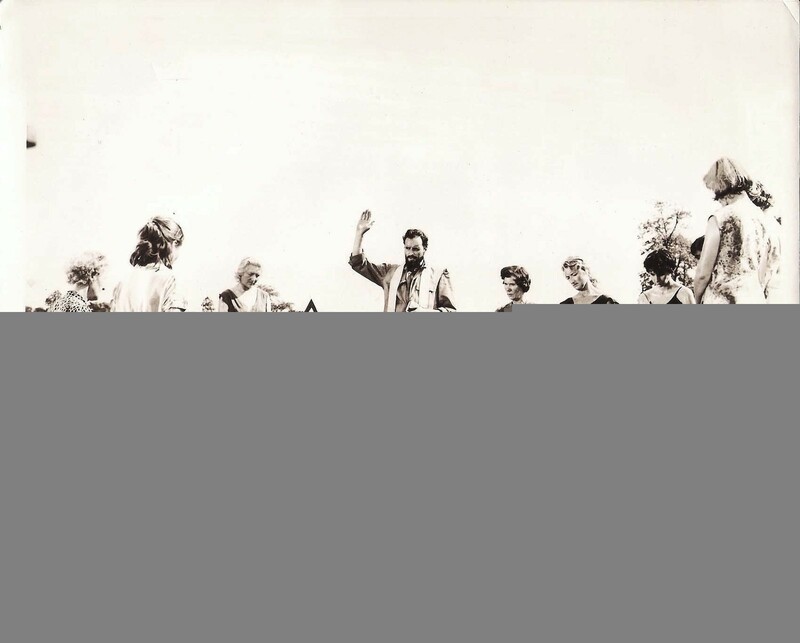 Fifth Day of Peace, 1971, with Richard Johnson. 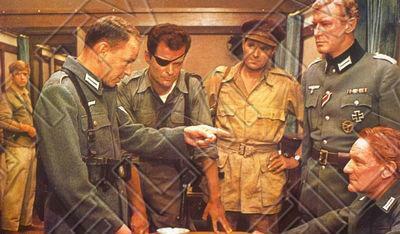 One of his best ever performances in a cameo role cast against type as a ruthless Canadian army general. Directed by Giuliano Montaldo. The film was never released in the UK. It has been indifferently reviewed (unjustly in my view) and features some great performances (although the Canadian accents of the mostly British actors are not very convincing). The DVD is unfortunately of very poor technical quality. Henry VIII and his Six Wives 1972, as Sir Thomas More, with Keith Michell. 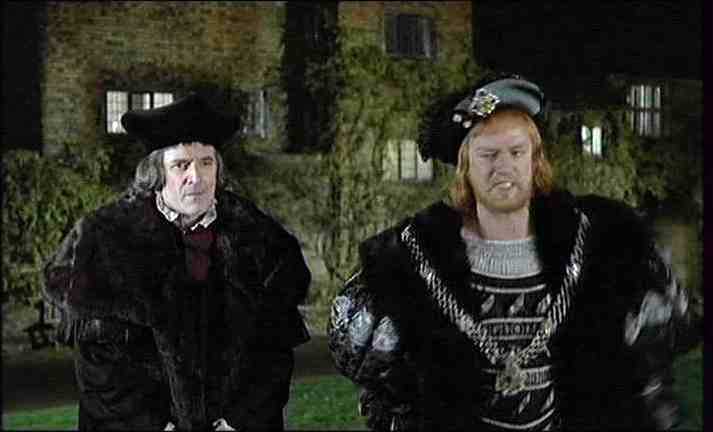 Goodliffe's make up for this role was particularly good as one can see by comparing the freeze frame with the portrait of More by Holbein. Sam, 1973, Granada Television with Harry Markham. Separate photo shows him with a belt used to punish his grandson, Sam. John Finch, who devised the "Sam" series now has his own web site. DVDs of all 39 episodes of the series can be bought also be bought online. 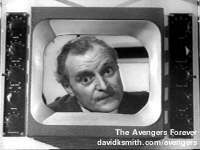 The most interesting episodes are the early ones and they include some of Goodliffe's best and most memorable acting. Hitler: the last 10 days, 1973, in a very brief appearance as General Helmuth Weidling. Title role played by Alec Guinness. The Woodlanders BBC 1973: Goodliffe appeared with Felicity Kendal, David Burke and Annette Robertson. 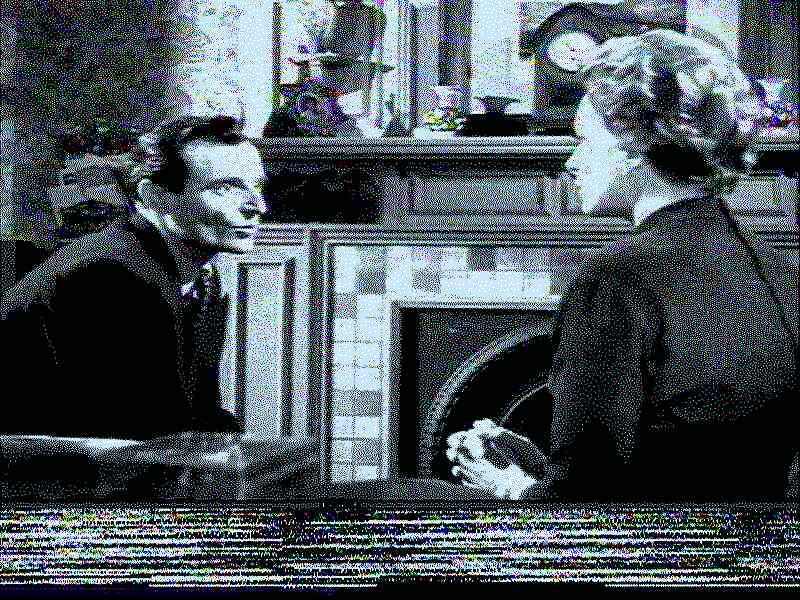 The recording cannot, alas, be found in the BBC archives and no stills have been preserved. 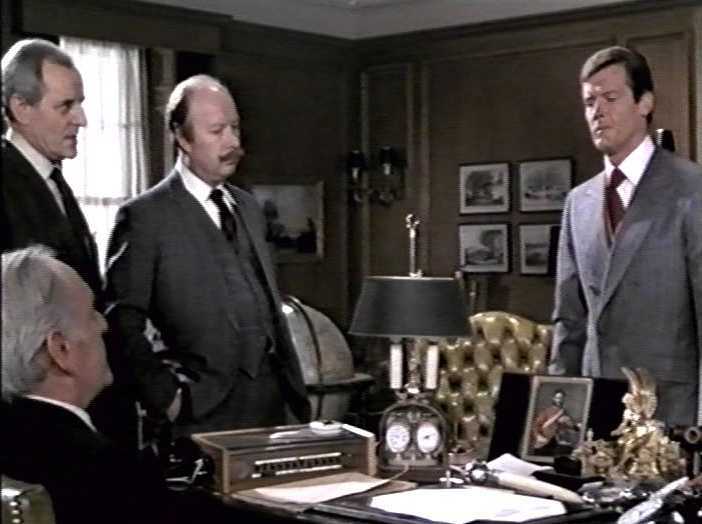 Man with the Golden Gun, 1974, (a James Bond film) with Bernard Lee, James Cossins and Roger Moore. In Sickness and in Health, with Prunella Ransome. An episode in the "Armchair theatre" series. 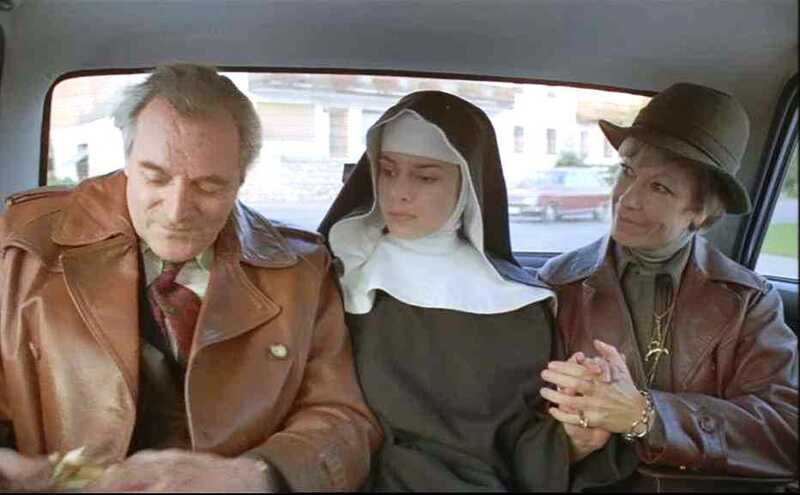 His last film, To the Devil a daughter, 1976, with Natassja Kinski and Eva Maria Meineke. His last part at Liverpool Rep, mid 1930s. The writing on the back of the photo says "N.B. The thing between my legs is my tail." The Kriegies of Oflag 64, describing the experiences of US prisoners of war. 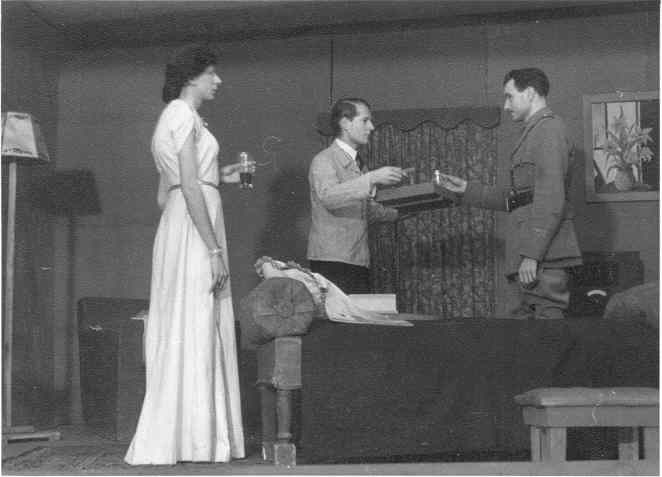 A web site featuring photographs of a number of theatrical productions at other prisoner of war camps: "Ballet Nonsense" at Colditz, what looks like a play by Sheridan or Goldsmith, "The Time Machine" at Stalag IXC and a number of productions at Stalag VIIIA including Noel Coward's "Hay Fever". 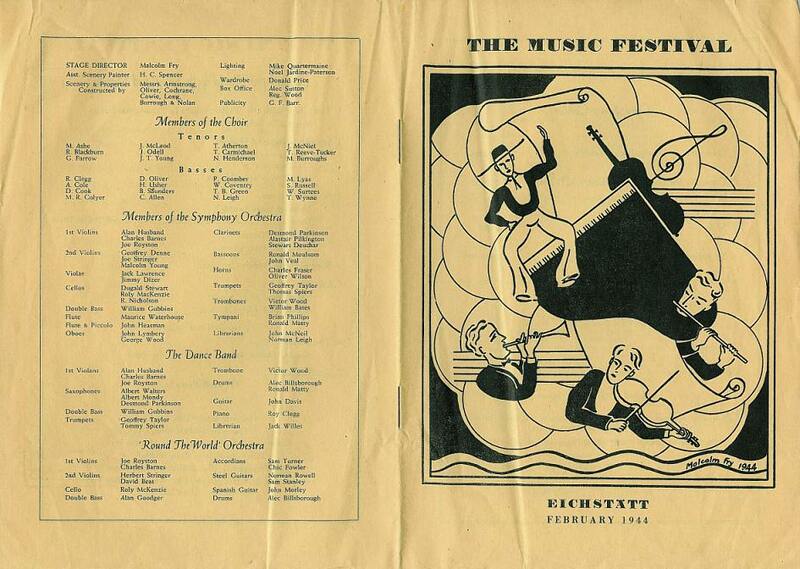 Some photographs and other images from Eichstätt have recently been added, including the programme from the Music Festival held there in 1944 and some of the programmes from the theatrical productions. 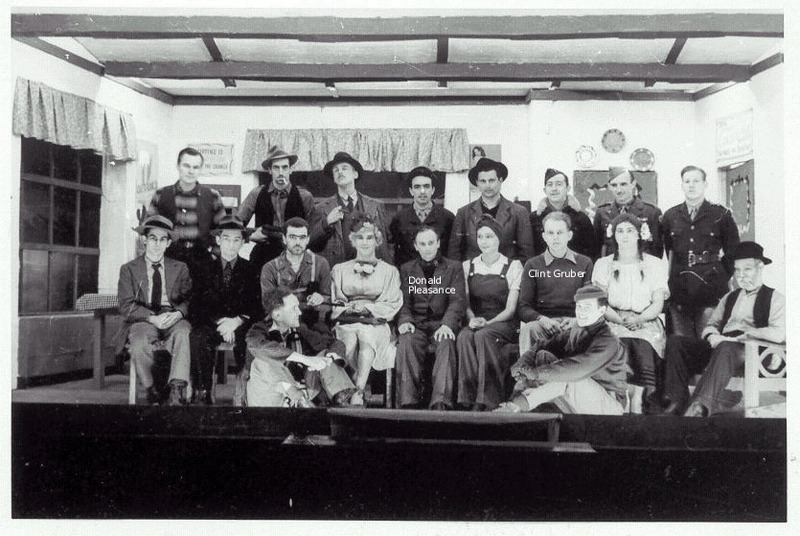 There is also at least one theatrical production put on French and/or Belgian prisoners of war, "Le Mariage de Mlle Beulemans" by Fonson and Wicheler staged at Stalag XIB for which there is a programme and photographs. A site devoted to Stalag Luft I. It features a rare photograph which includes Donald Pleasence, who subsequently became a film star and who also put on plays in POW camps. Michael Goodliffe; Michael Goodliffe; Michael Goodliffe; Michael Goodliffe; Michael Goodliffe; Michael Goodliffe; Michael Goodliffe. Prisoner of War; Prisoner of War; Prisoner of War; Prisoner of War; Prisoner of War; Prisoner of War; Prisoner of War; Prisoner of War.